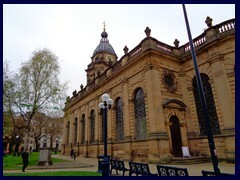 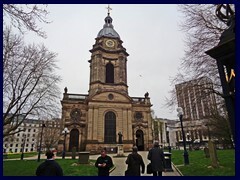 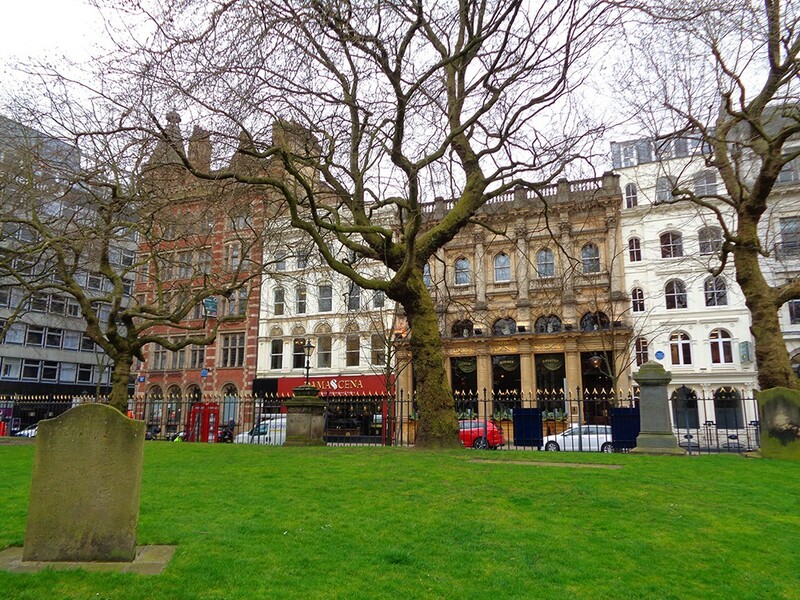 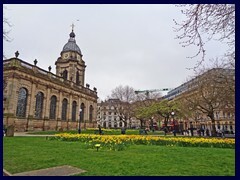 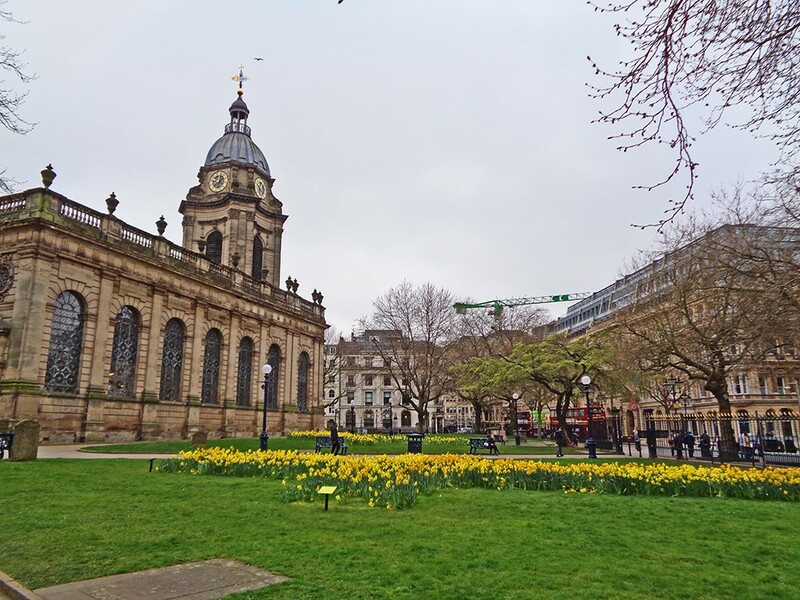 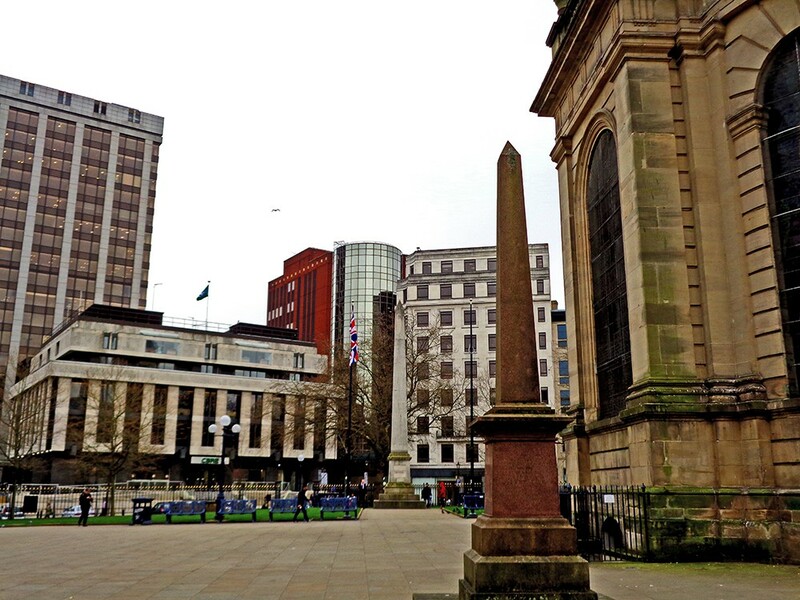 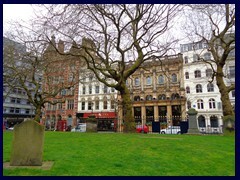 Cathedral Square, bordered by Colmore Row and Temple Row, is the green space that surrounds the Birmingham Cathedral, also called St Philip's Cathedral. 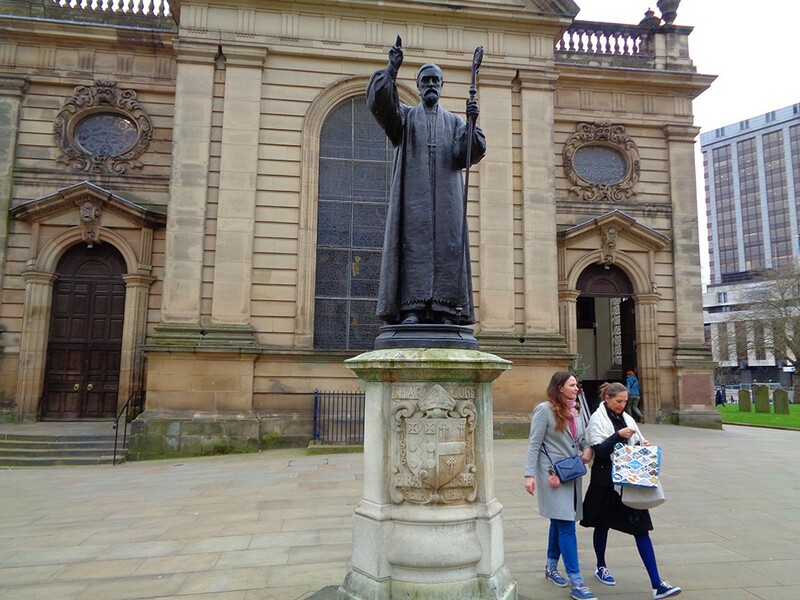 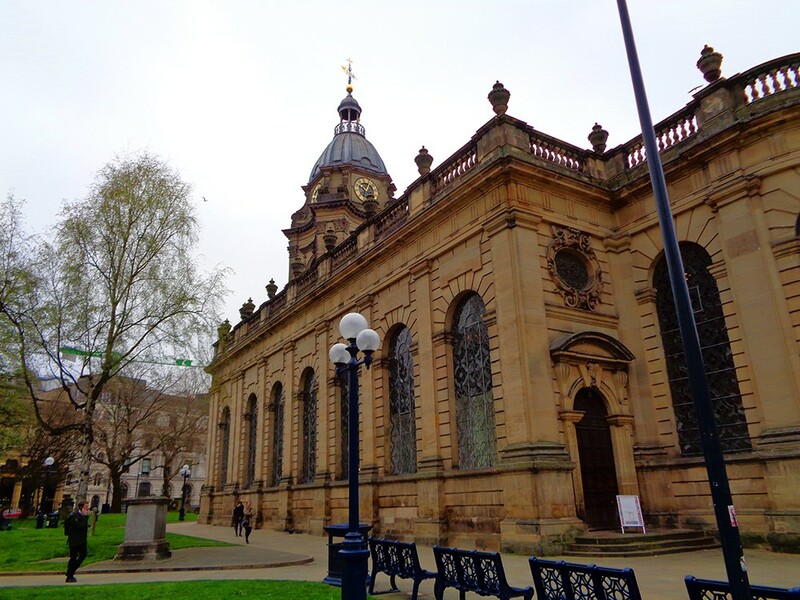 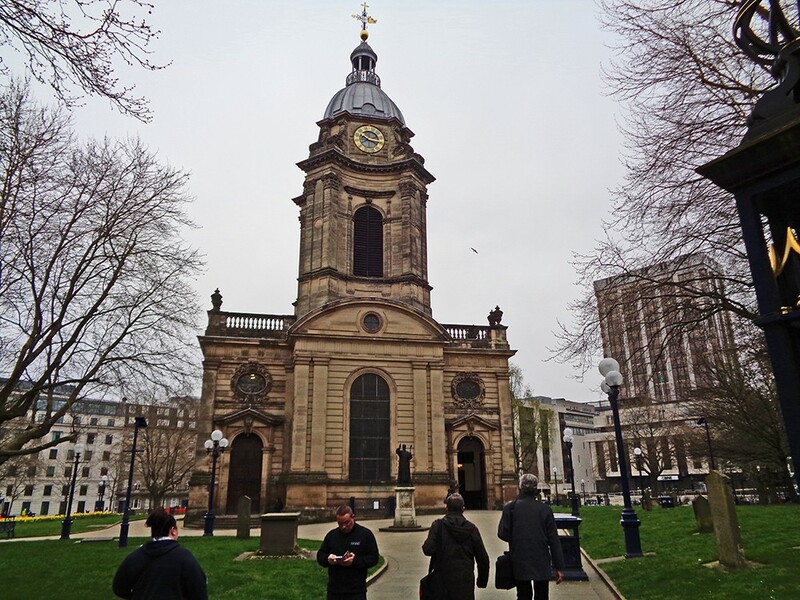 This baroque cathedral, designed by Thomas Archer, was built 1710-25 at a time when St Martin in the Bull Ring became too small for Birmingham's growing population. 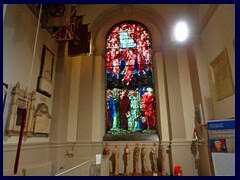 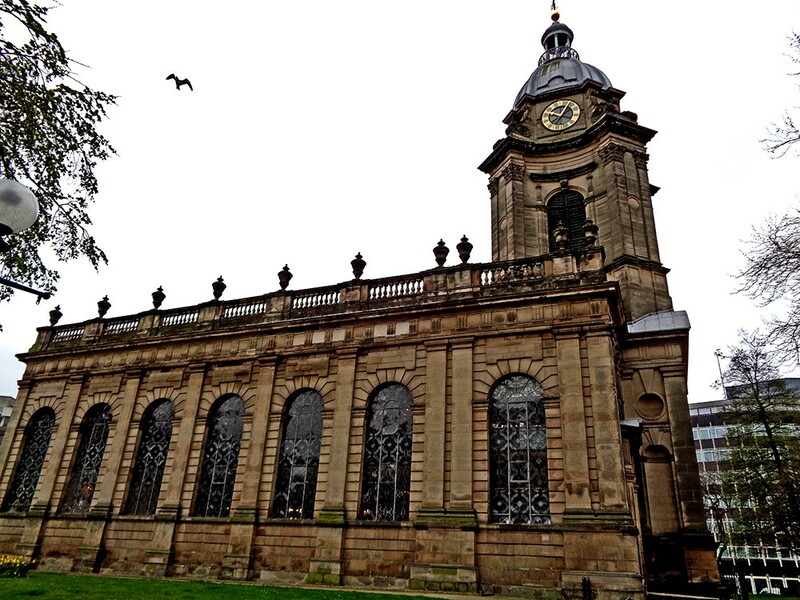 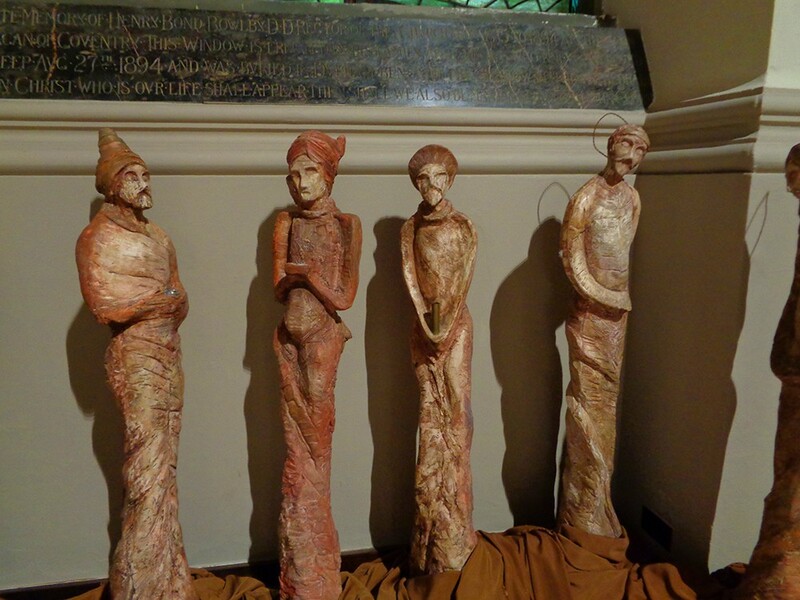 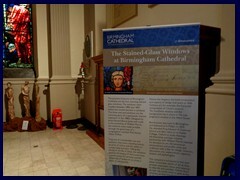 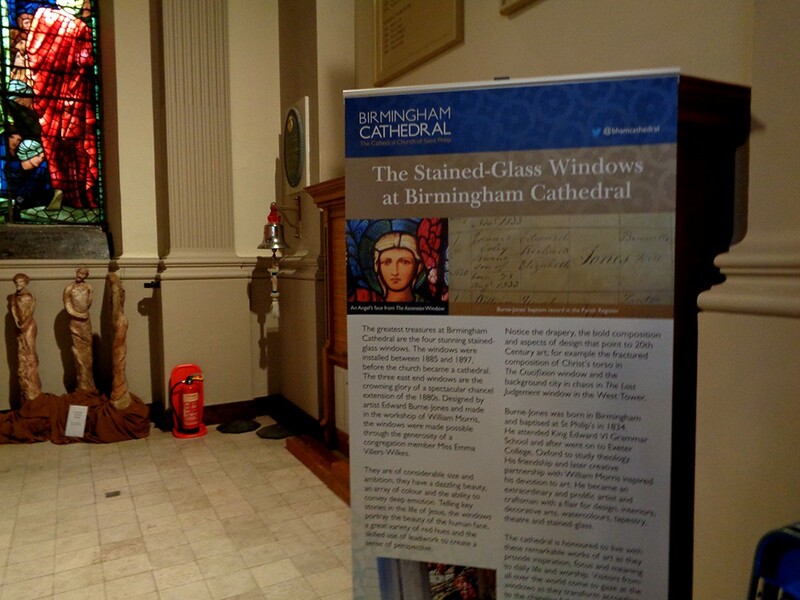 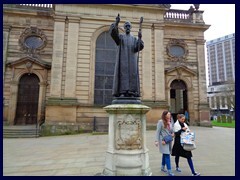 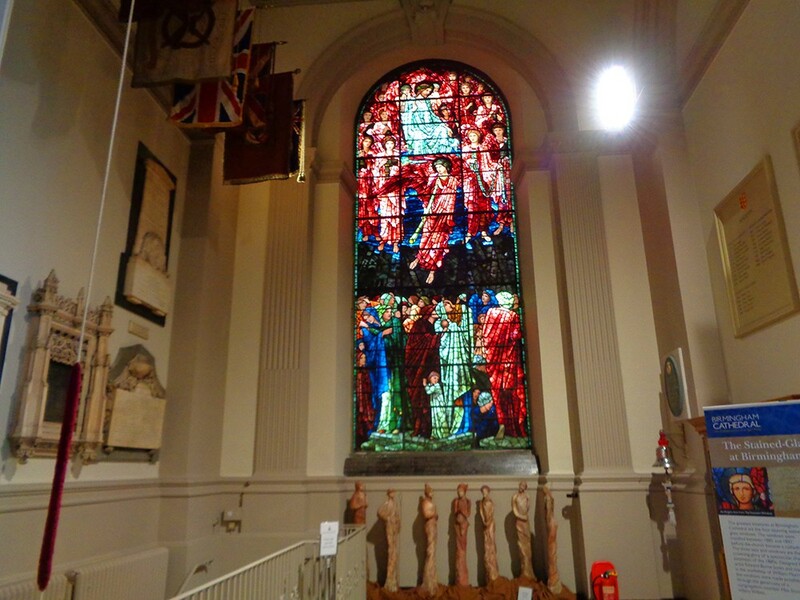 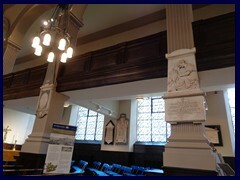 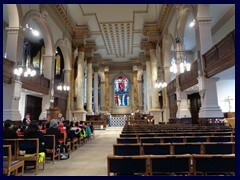 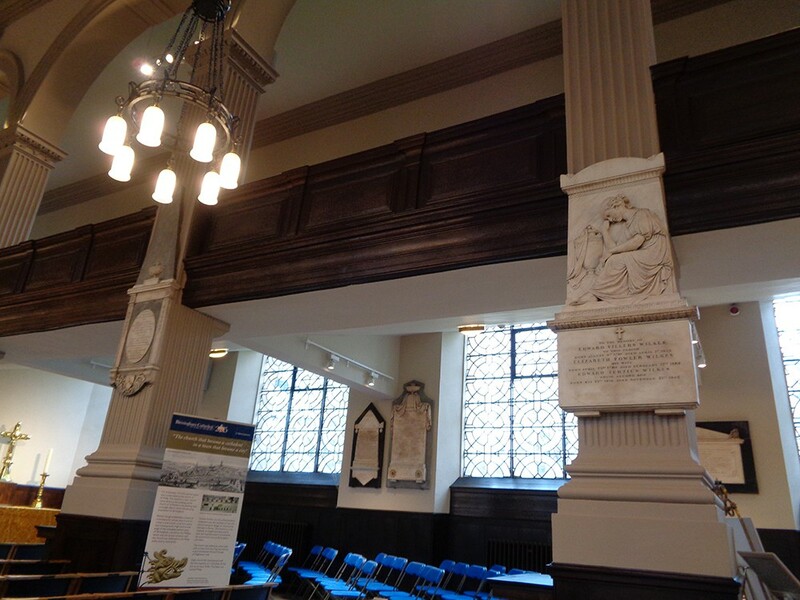 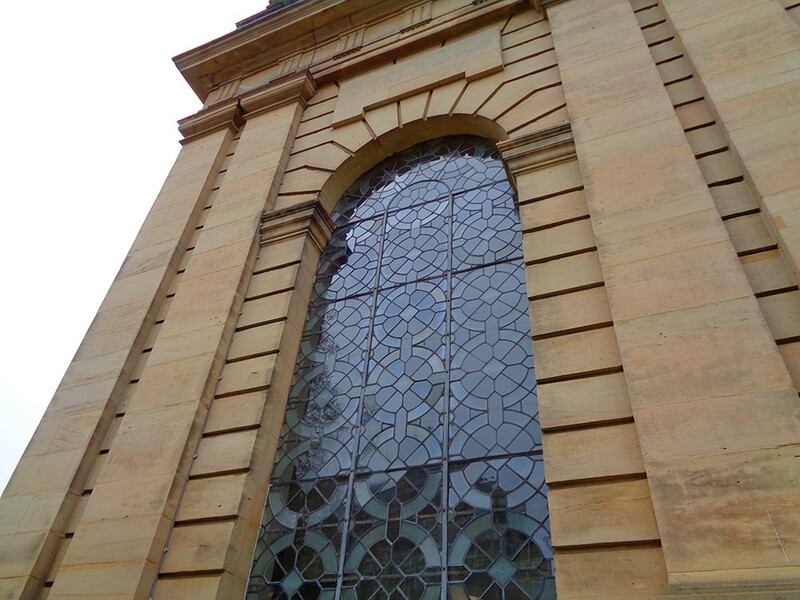 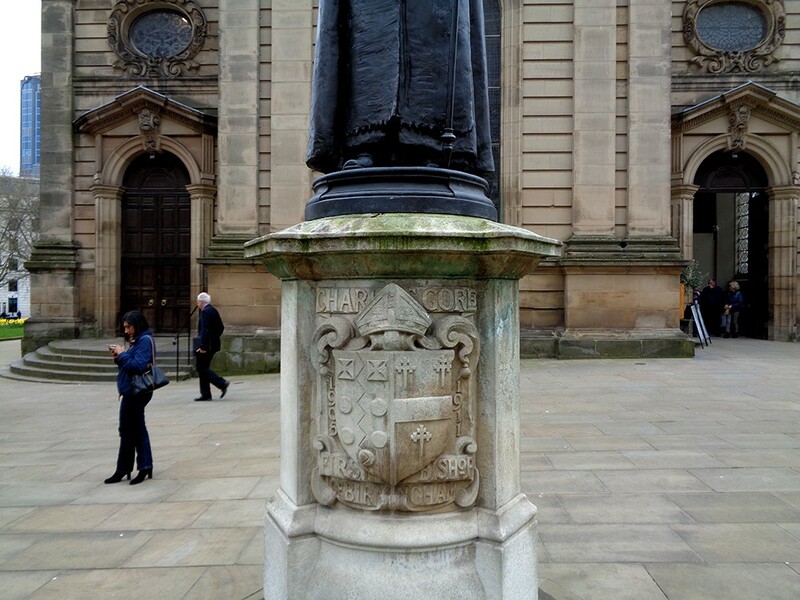 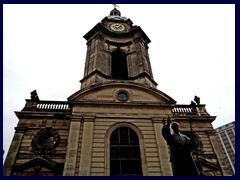 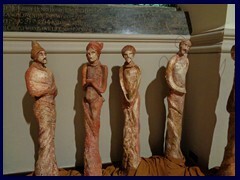 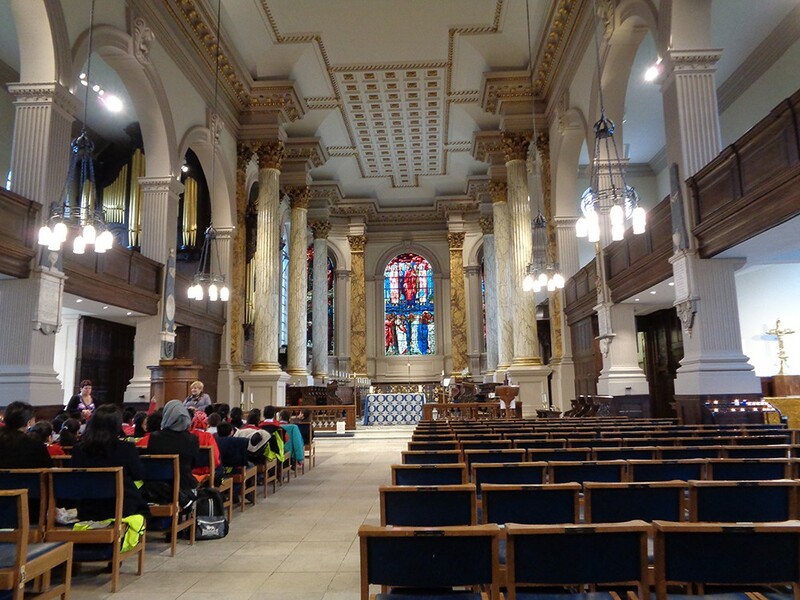 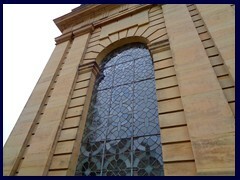 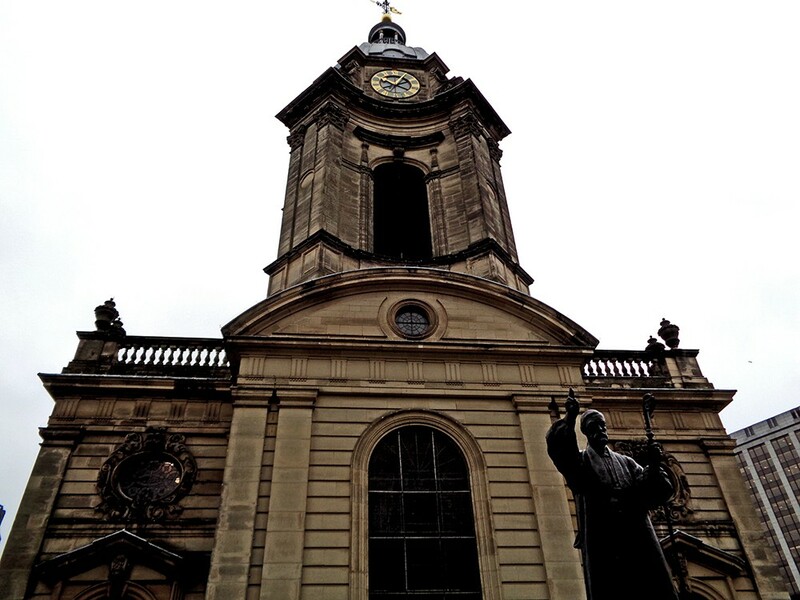 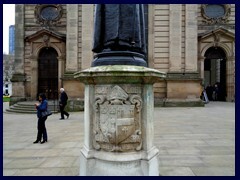 It is a state church of England and the seat of the bishop of Birmingham, a grade I listed building. 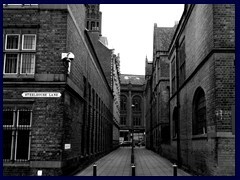 During our visit there was a school class going on, so we were by some strange reason told to leave the building after a short photo session. 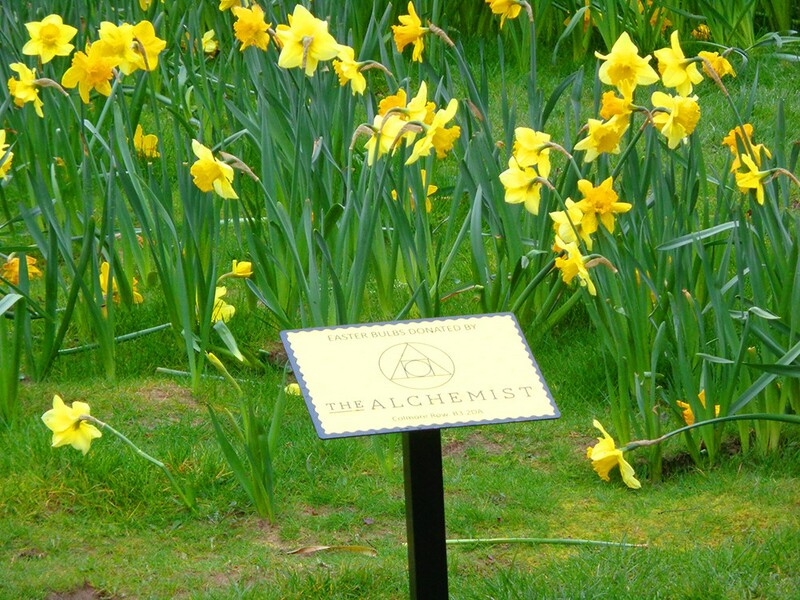 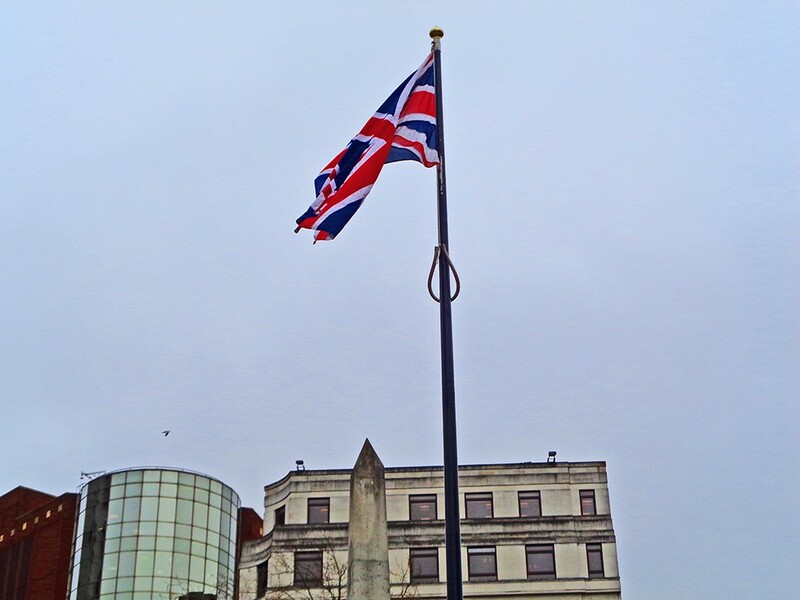 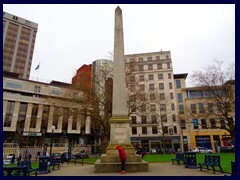 At the Cathedral Square, divided from the street by a fence, you also find a churchyard, the Burnaby obelisk, a high British flag, a memorial to the 1974 pub bombings, statues, beautiful flowers, trees, benches and lots of greenery. 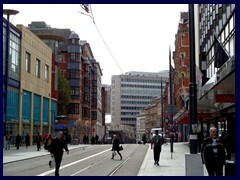 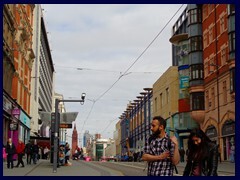 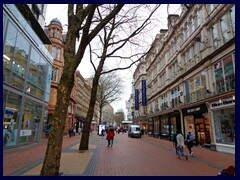 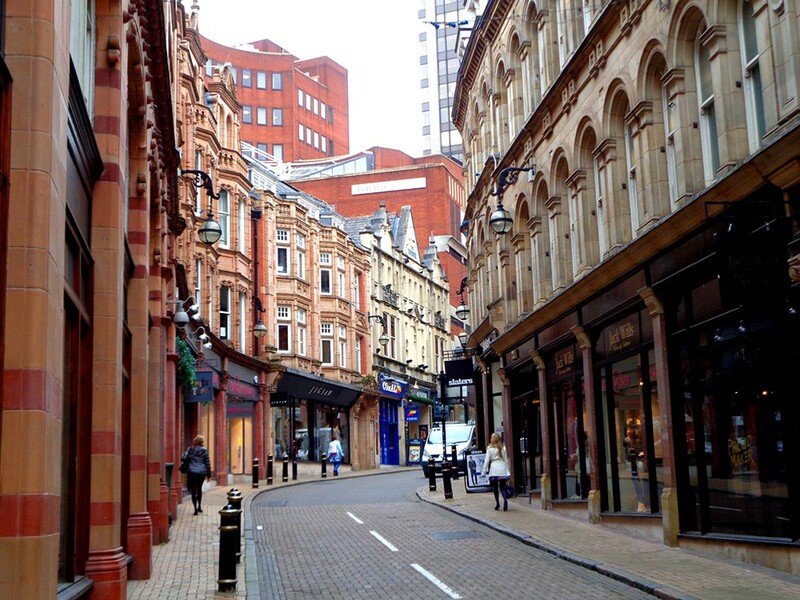 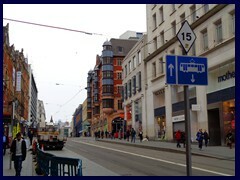 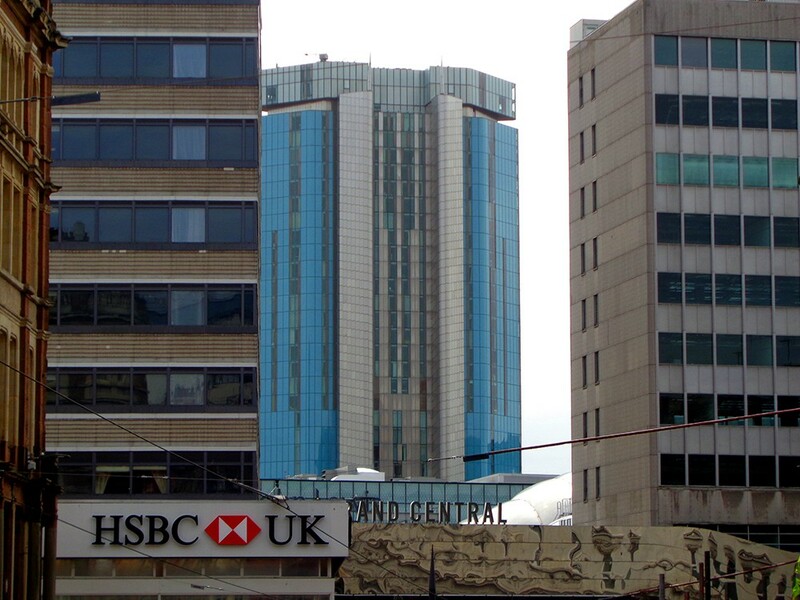 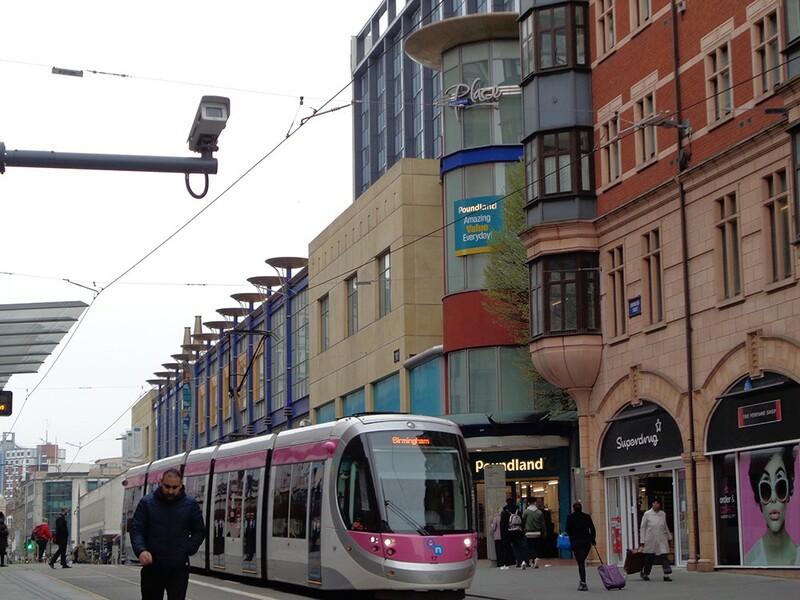 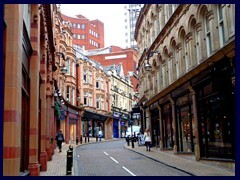 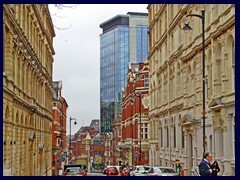 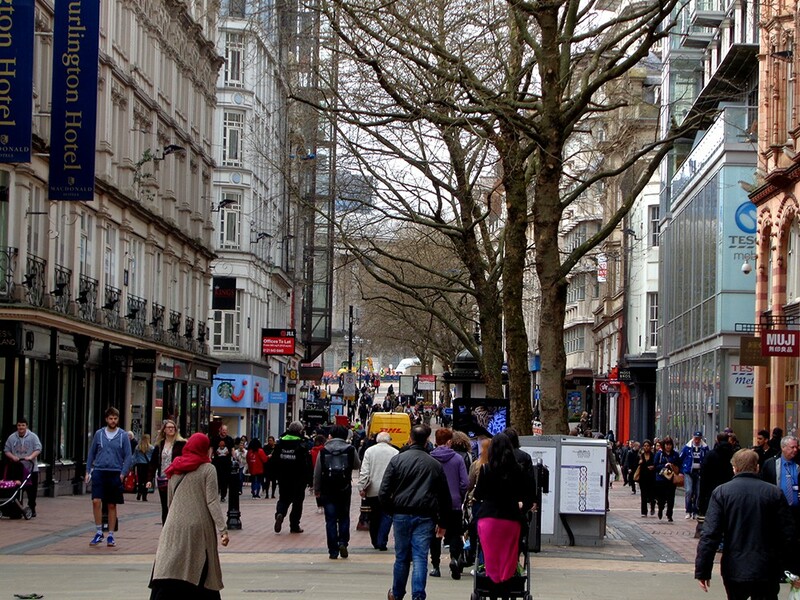 New Street is the main pedestrian shopping street of Birmingham. 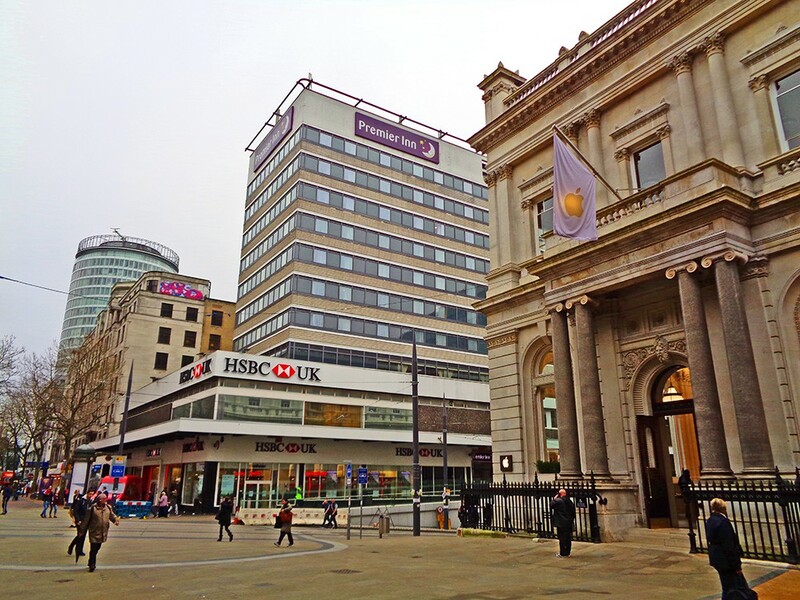 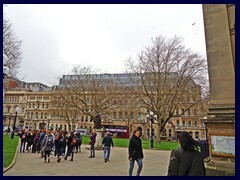 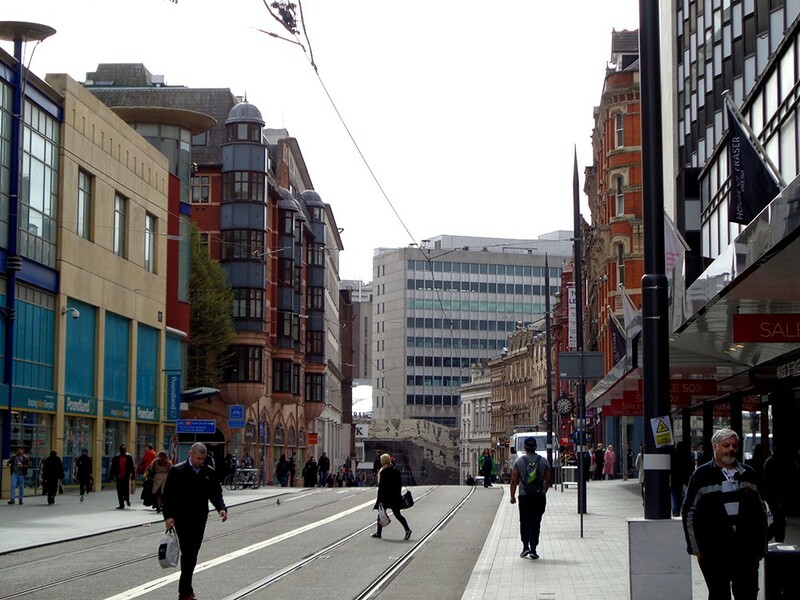 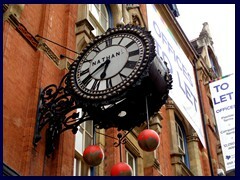 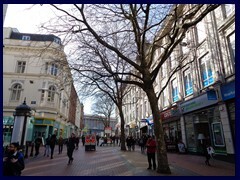 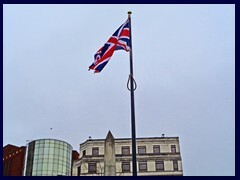 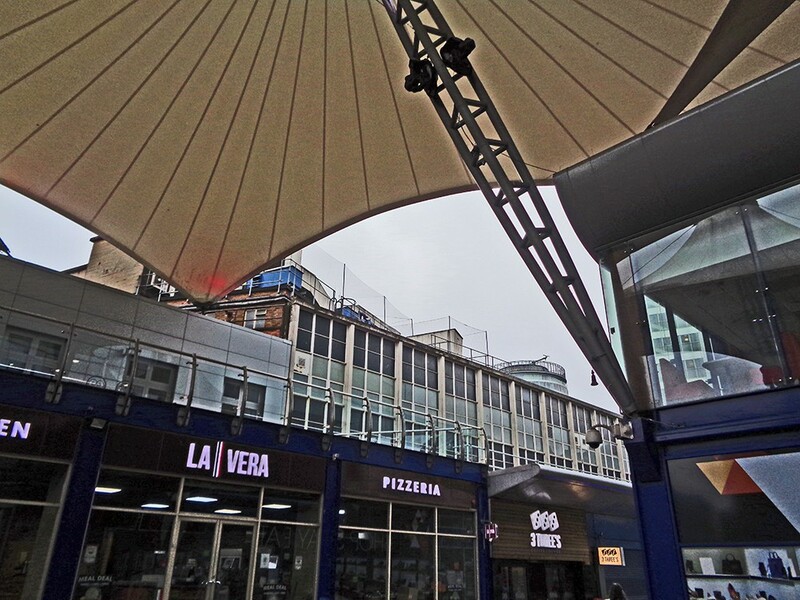 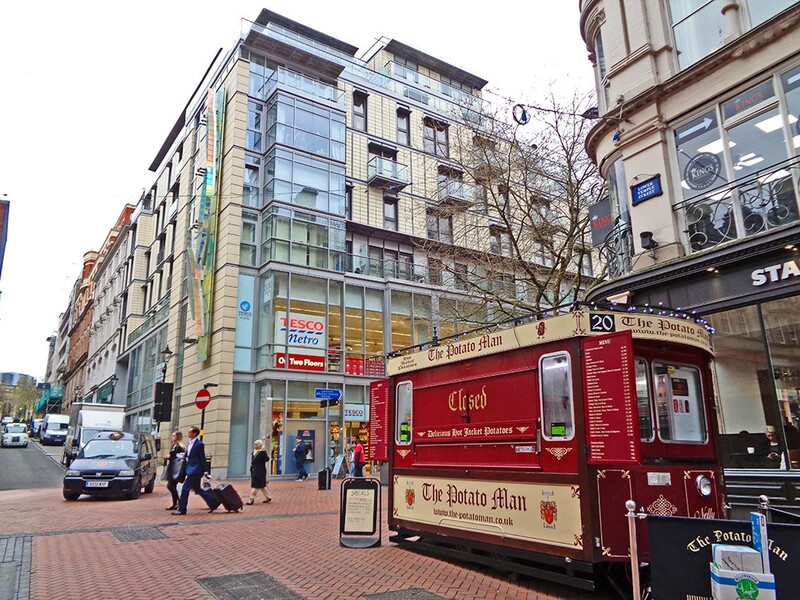 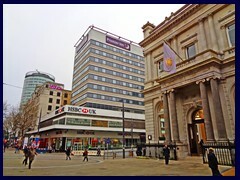 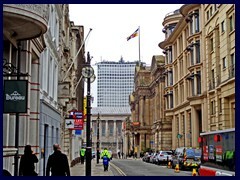 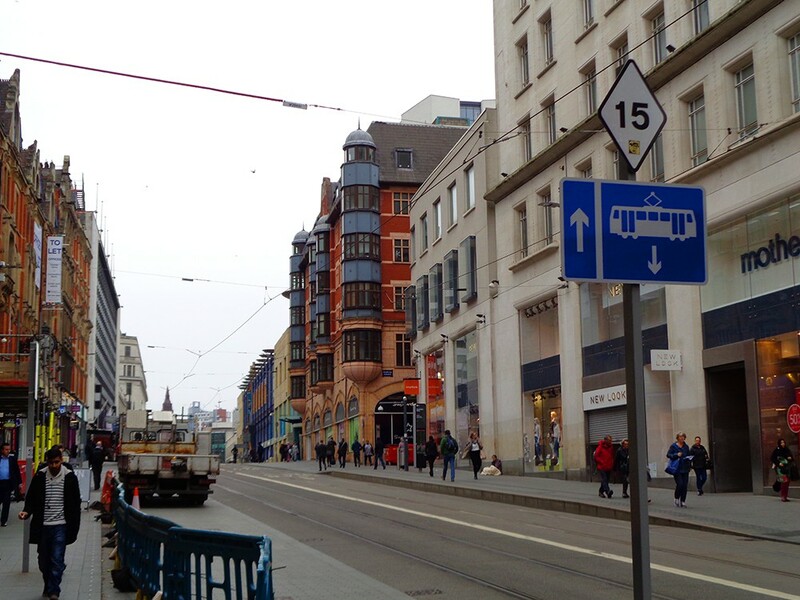 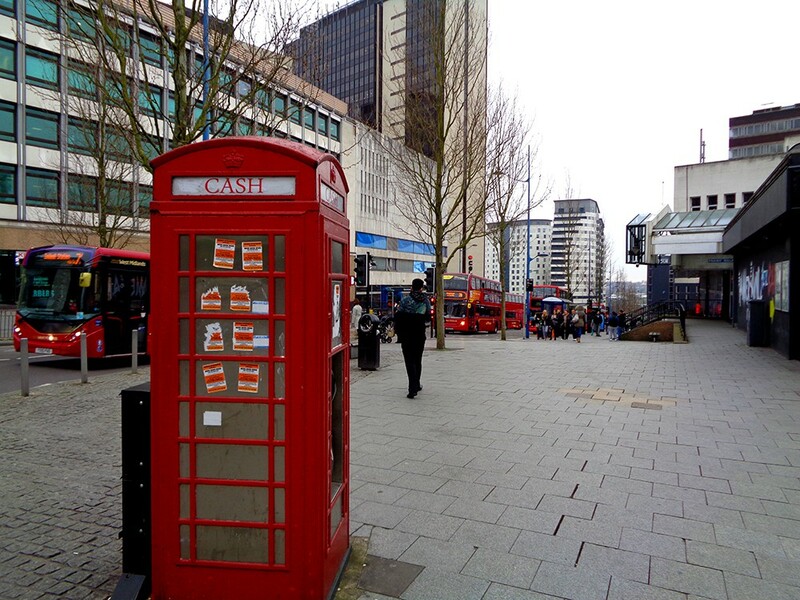 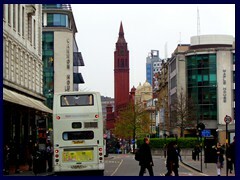 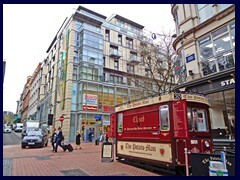 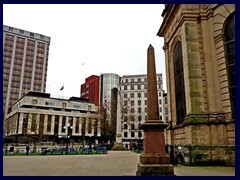 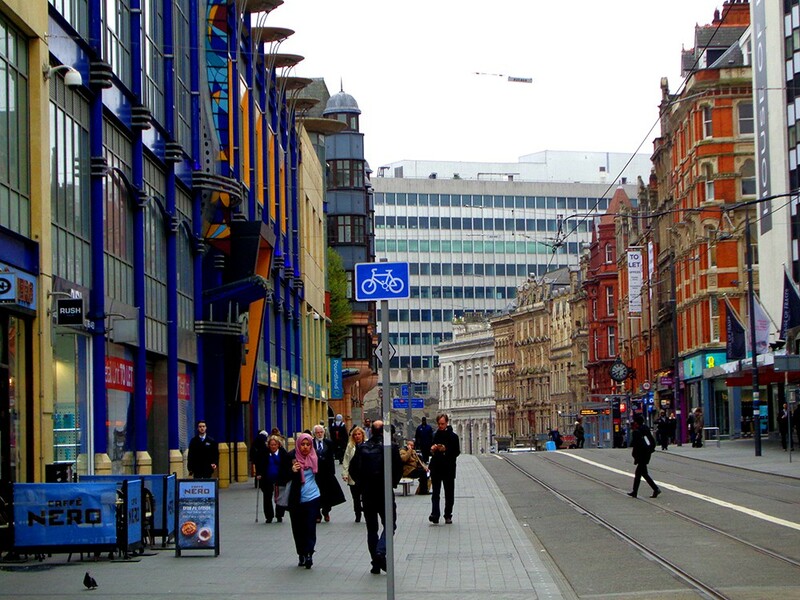 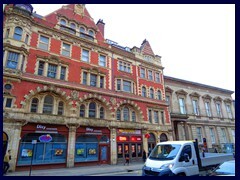 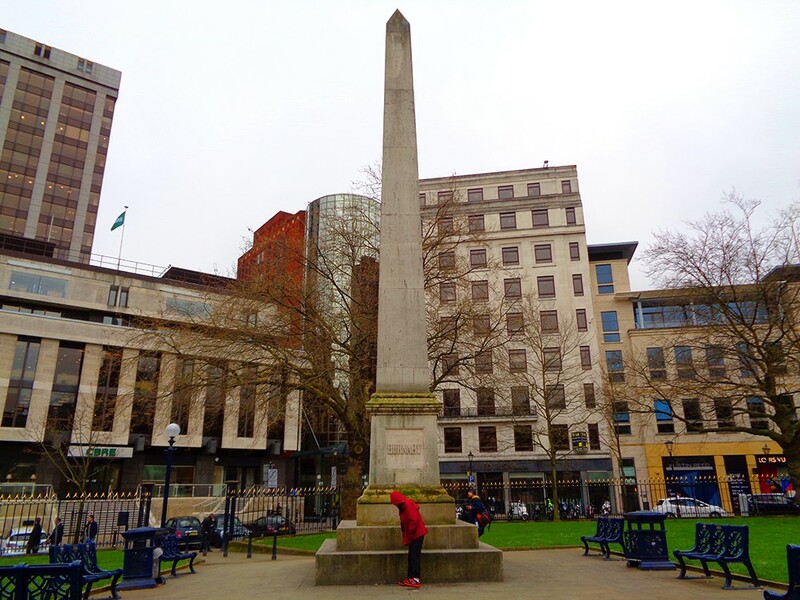 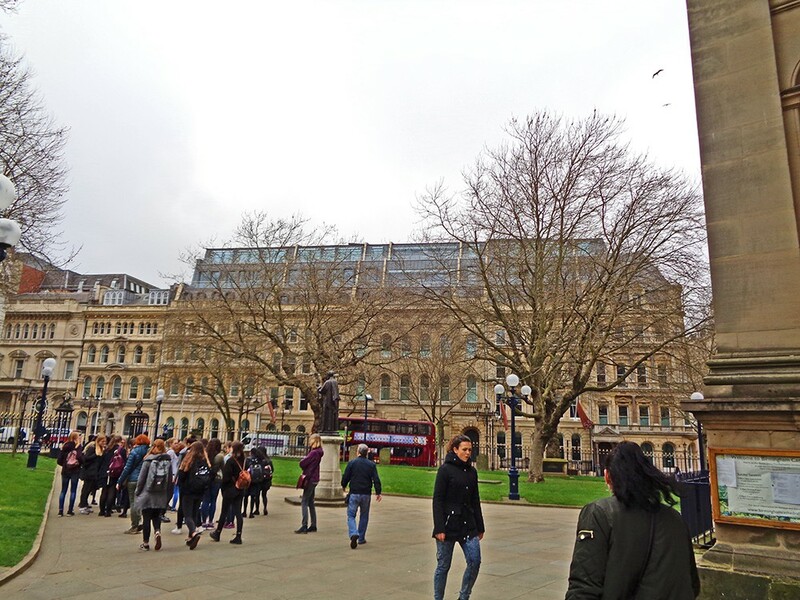 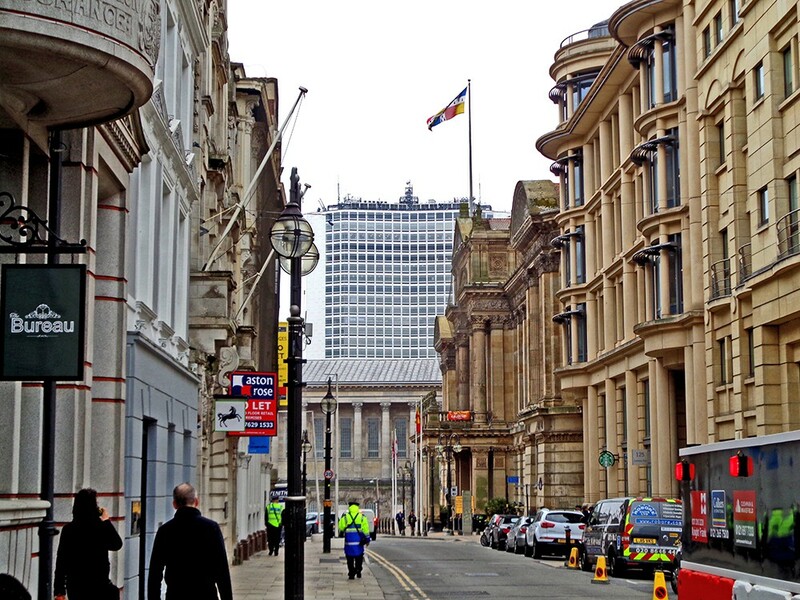 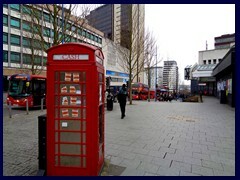 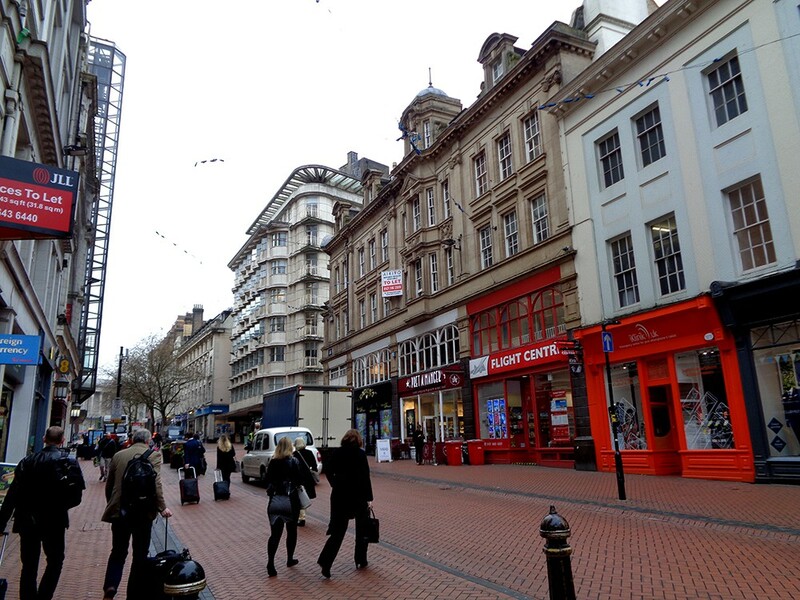 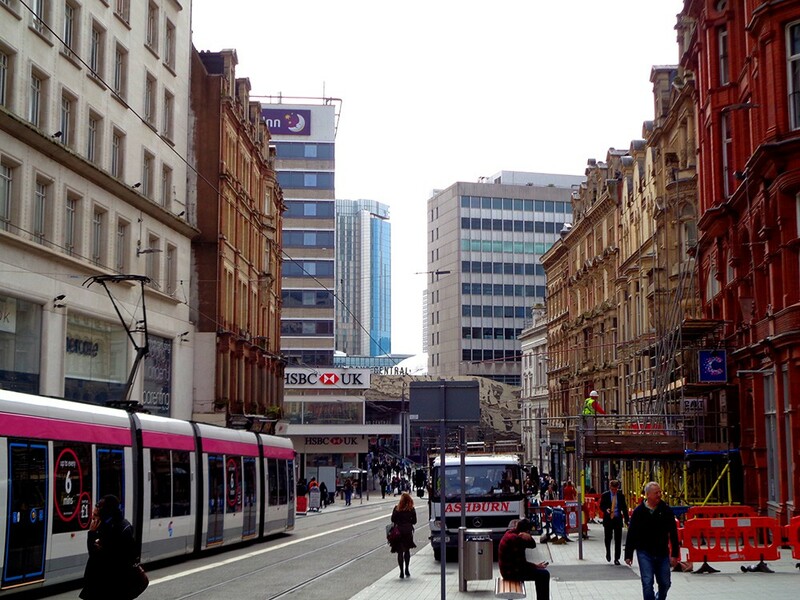 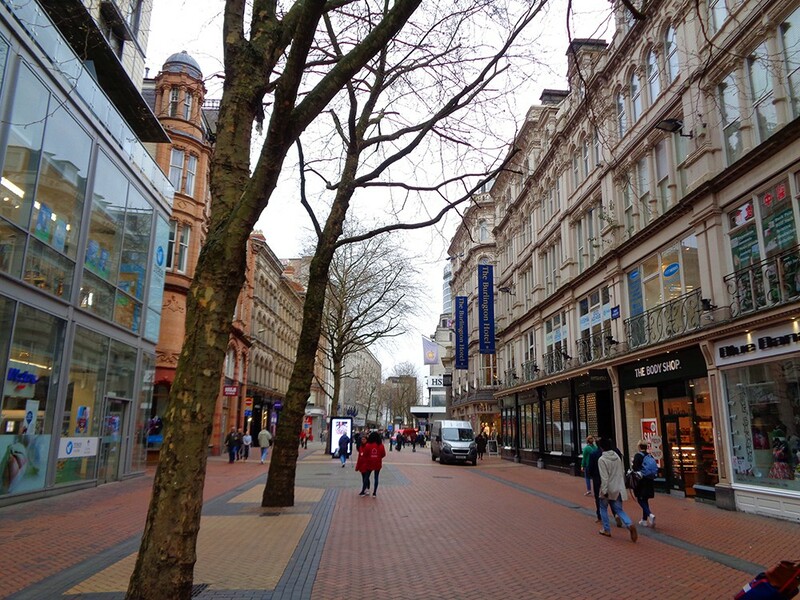 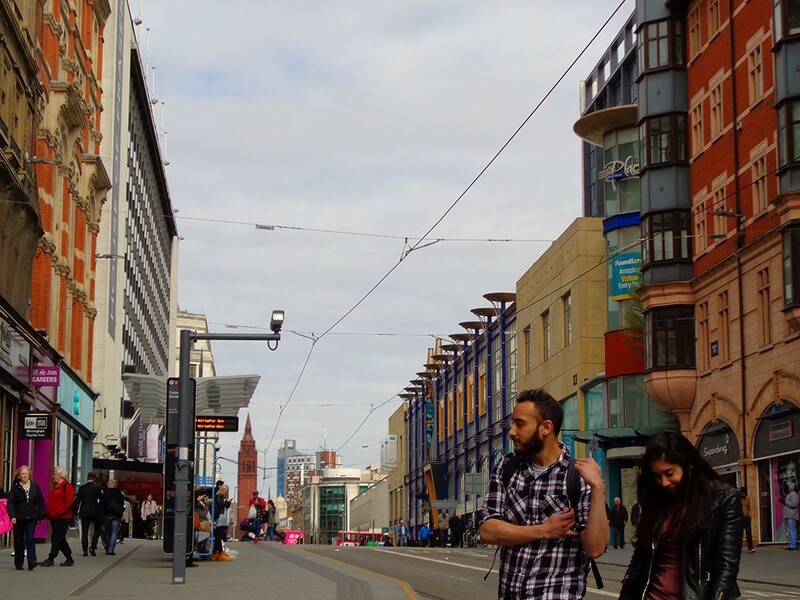 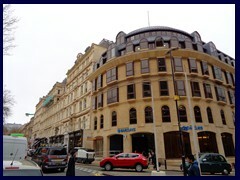 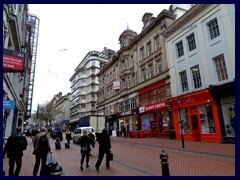 It is 500m long, has red and brown tiles on the ground and links Victoria Square with the Bull Ring shopping complex. 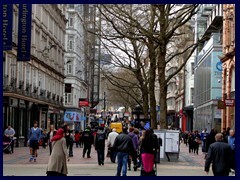 Here you find many popular brand stores. 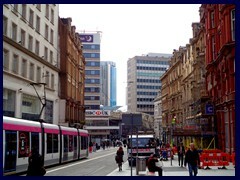 The large New Street Station is not directly situated at New Street, but one block to the South. 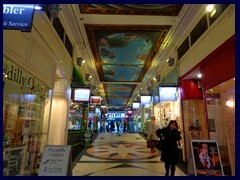 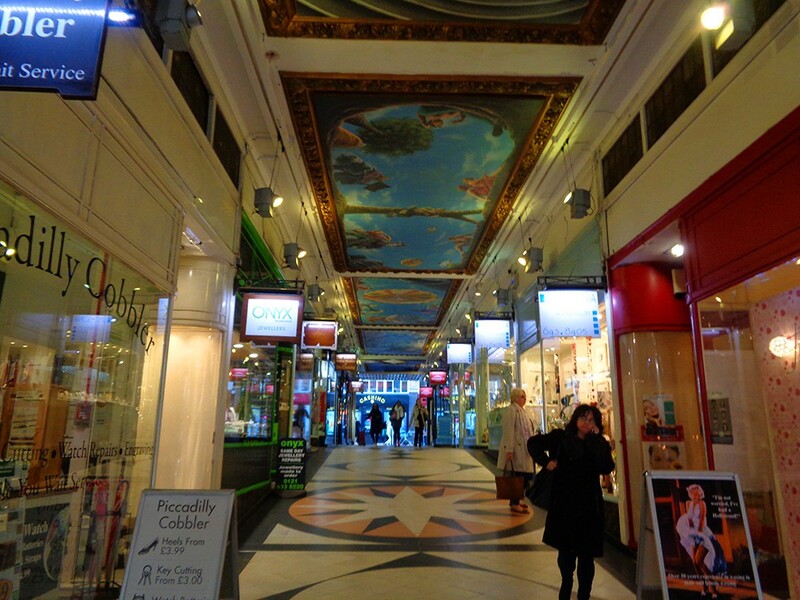 At New St you find the Piccadilly Arcade, a small but beautiful sloping arcade with paintings in the roof. 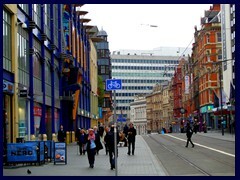 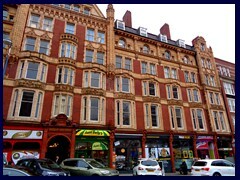 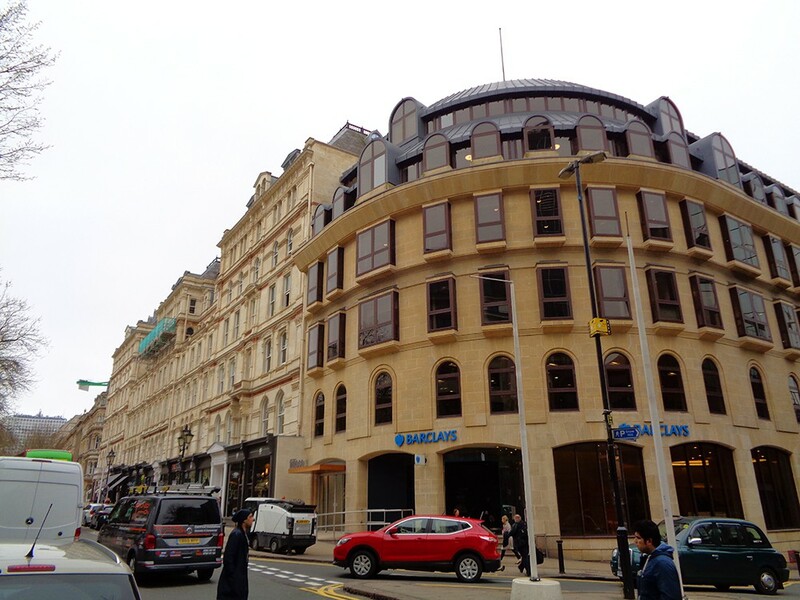 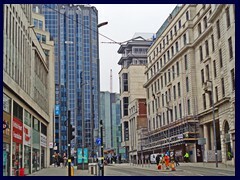 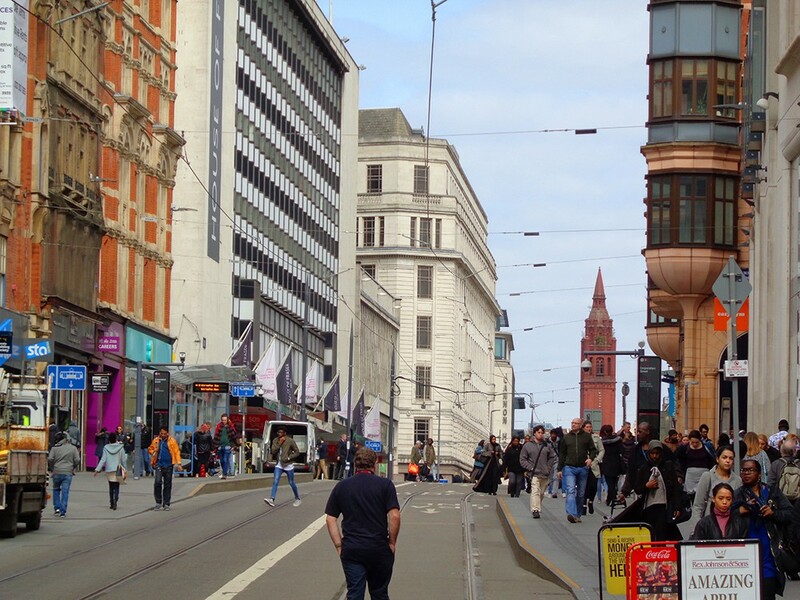 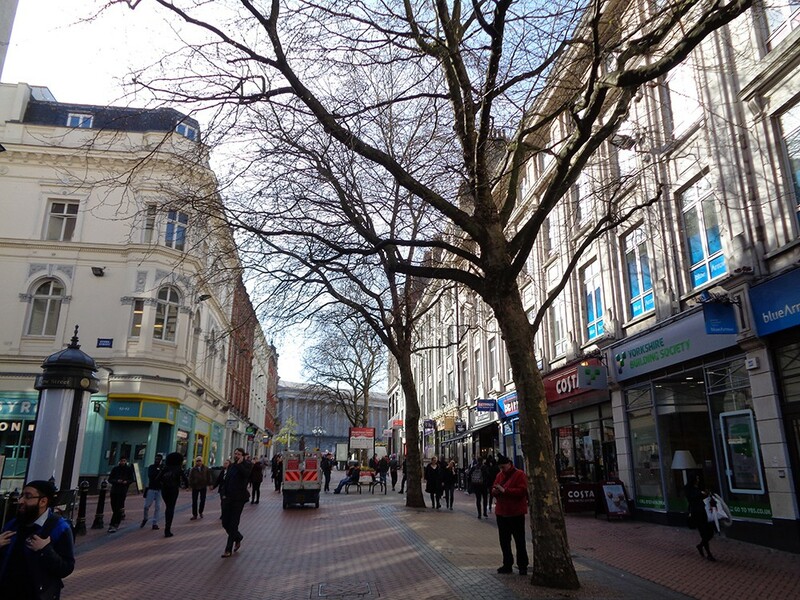 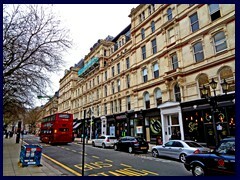 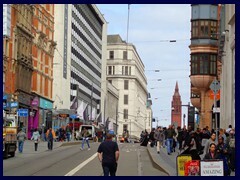 Corporation Street is a partly hilly main shopping street that begins at Stephenson Place at New Street, passes near the cathedral, is filled with large stores and is trafficated by modern trams and double decked buses. 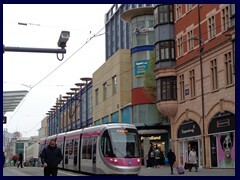 Battery powered trams were introduced again in 2015, more then 60 years after the old trams stopped service. 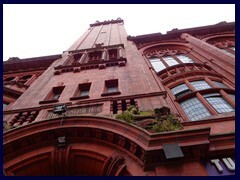 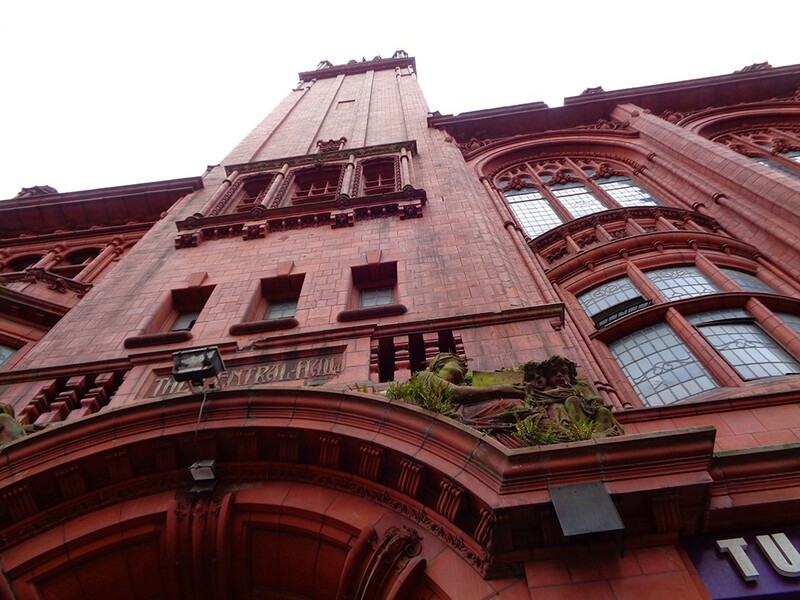 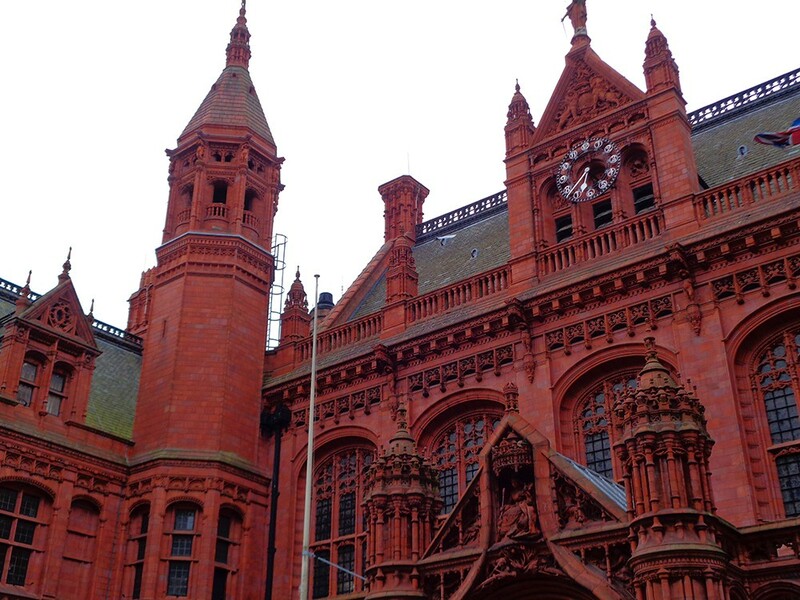 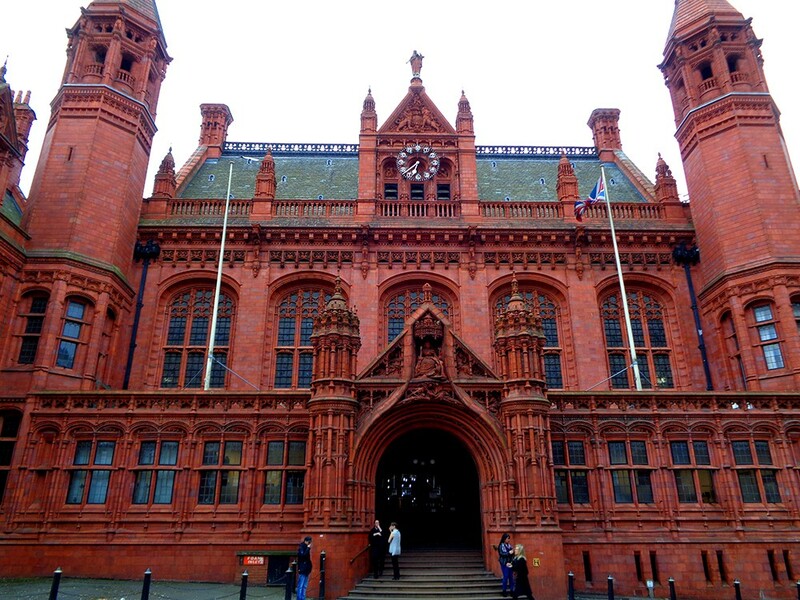 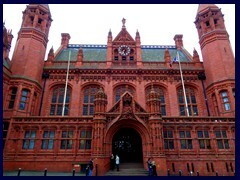 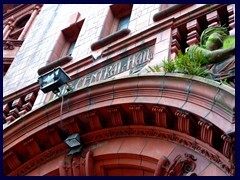 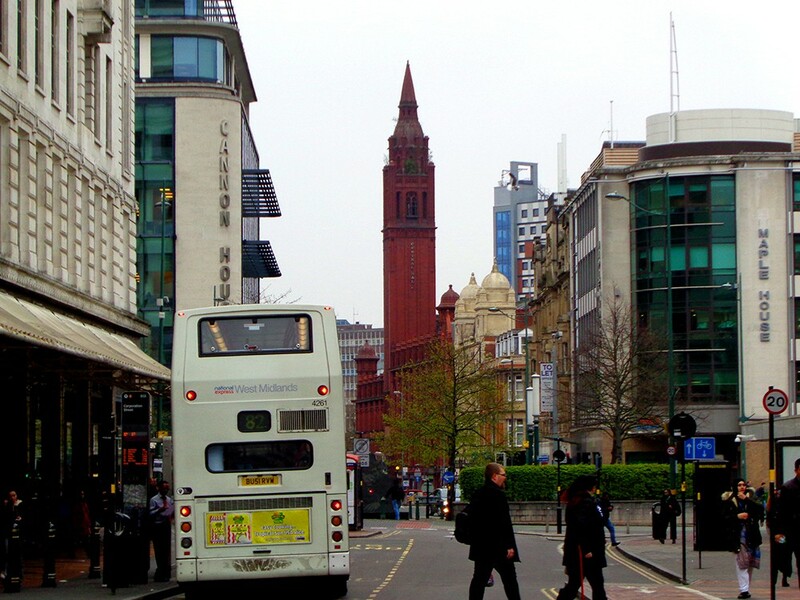 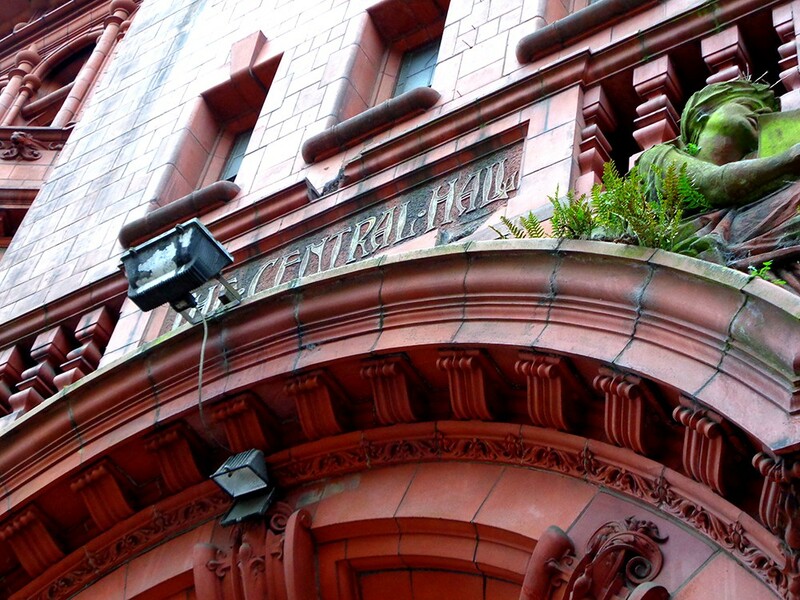 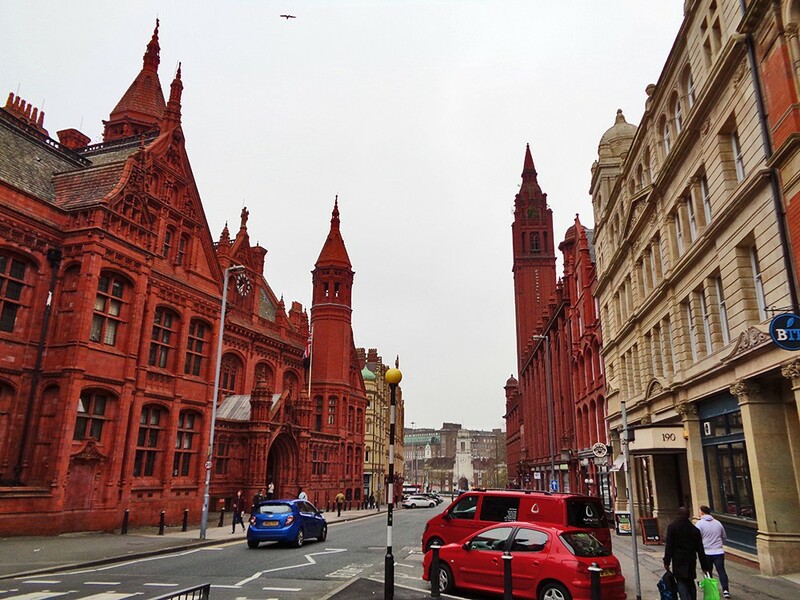 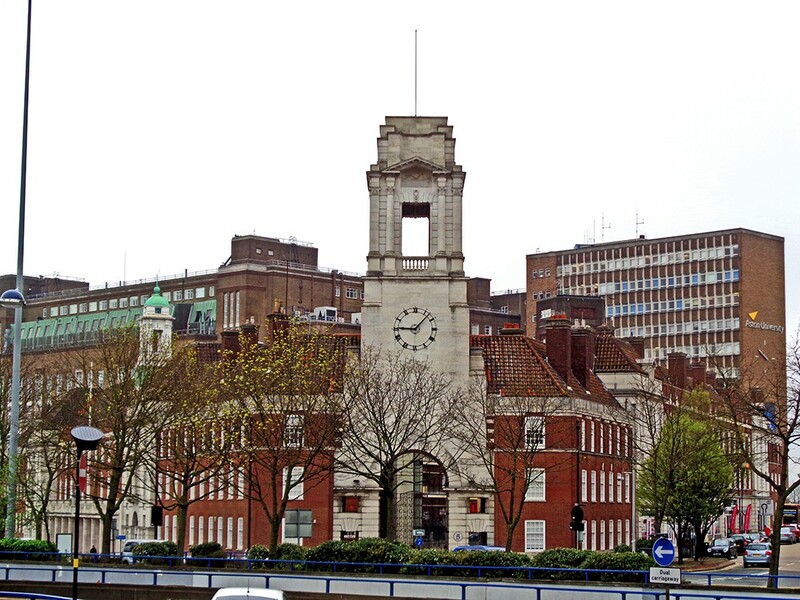 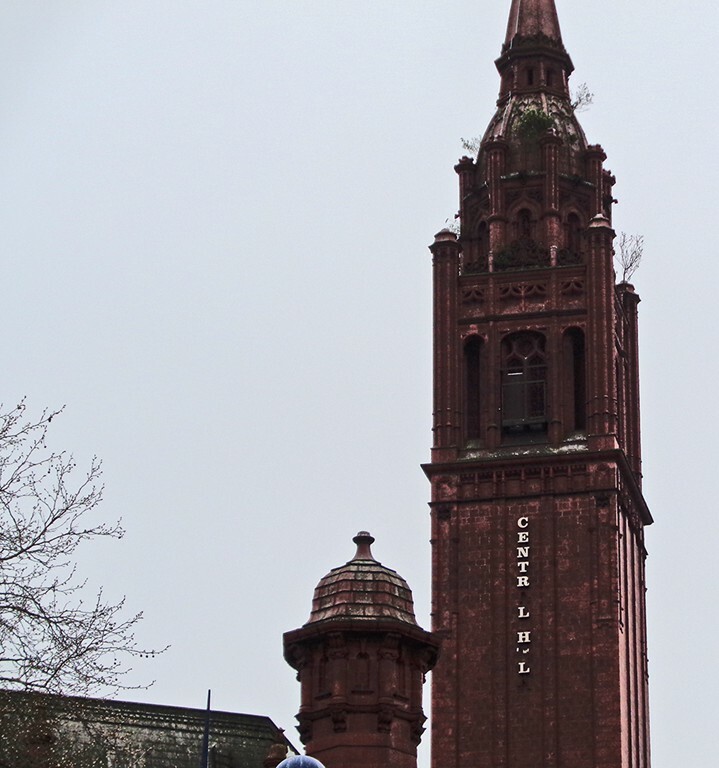 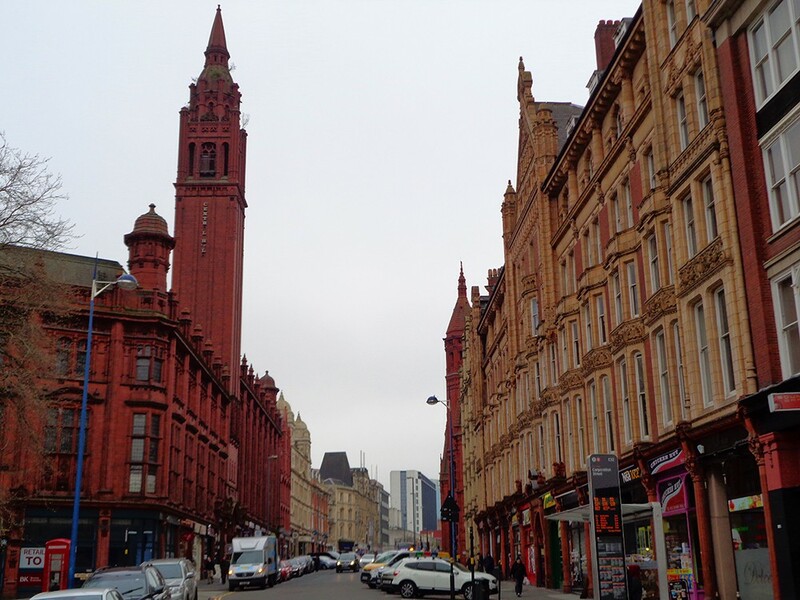 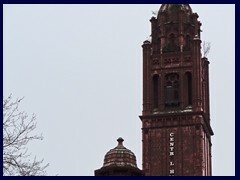 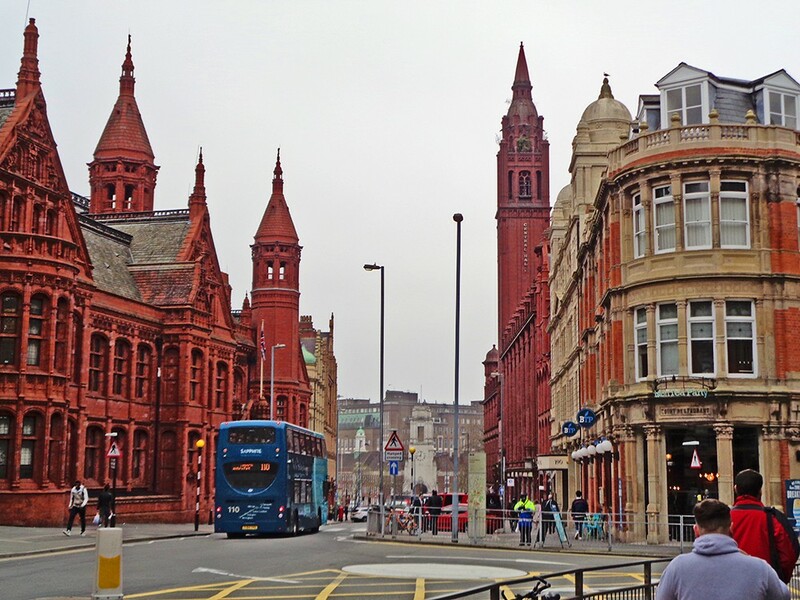 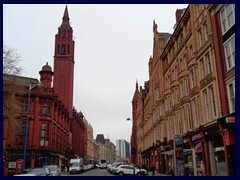 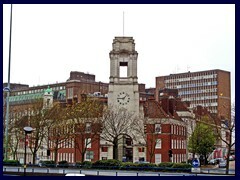 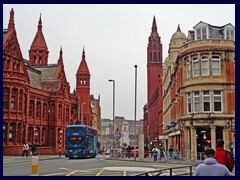 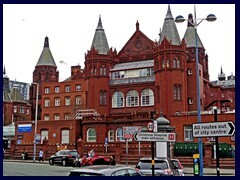 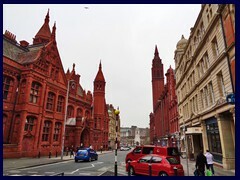 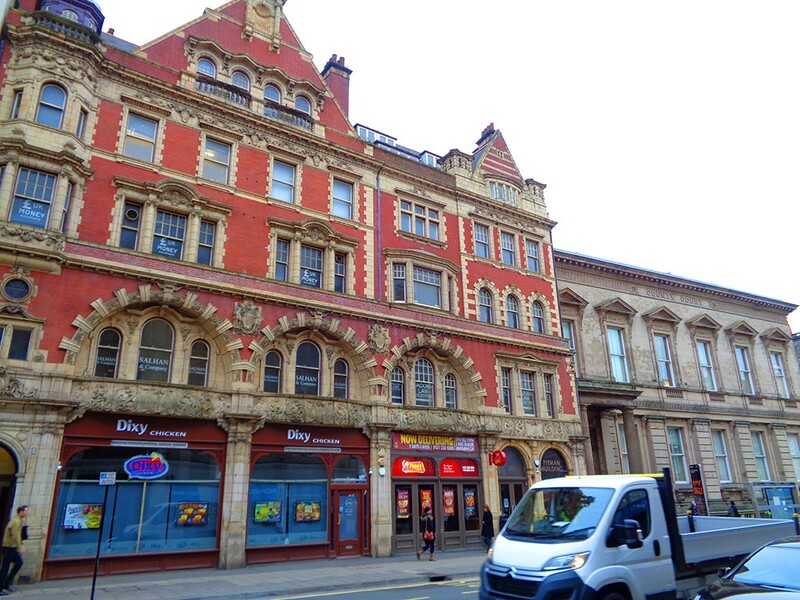 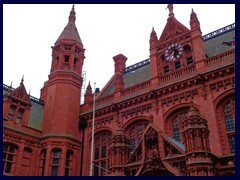 There are many Victorian buildings along the road, like the red brick and terracotta Victoria Law Courts with its bell tower, and the similar looking Methodist Central Hall opposite. 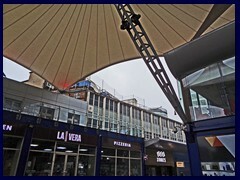 The mall Martineau Place is also here, as well as an Apple store and a HSBC bank. 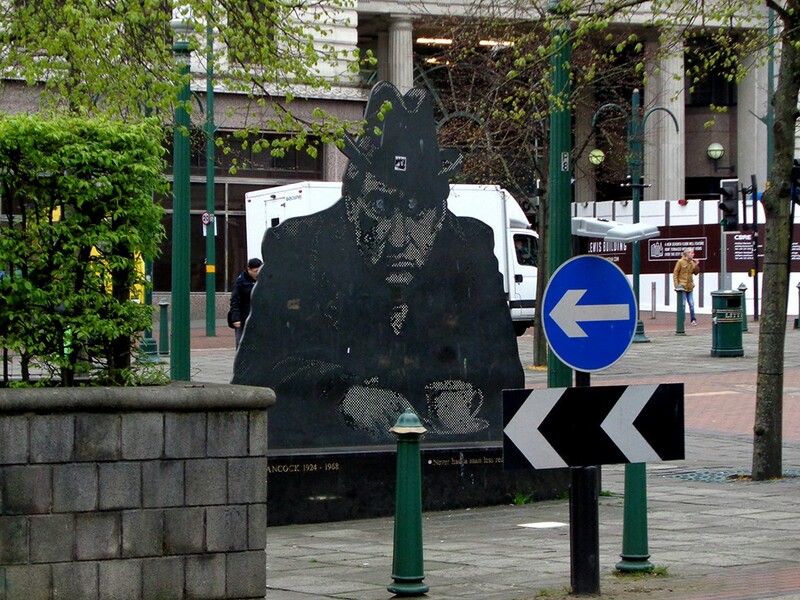 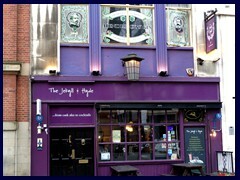 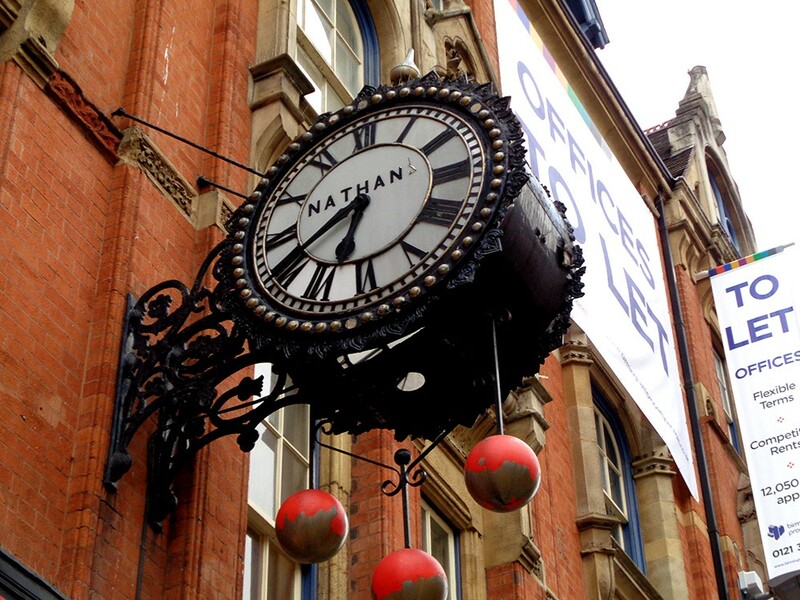 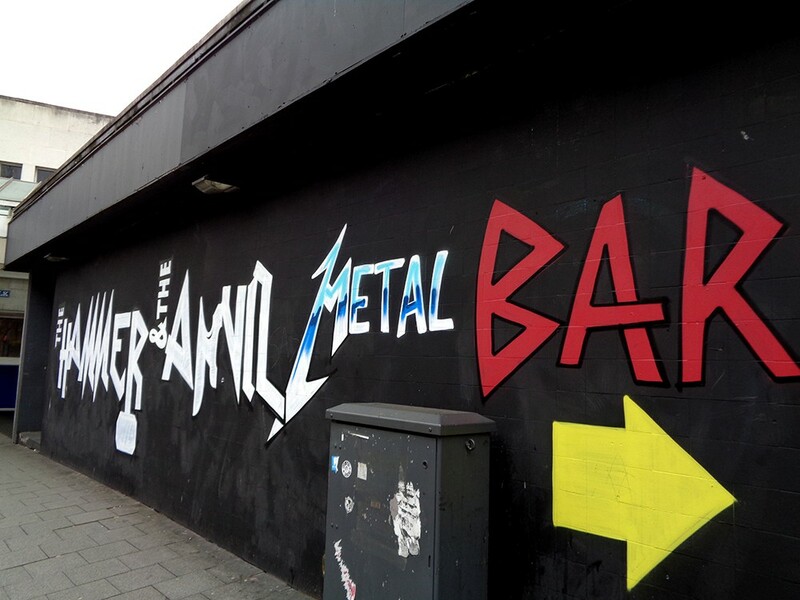 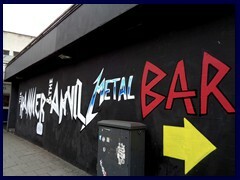 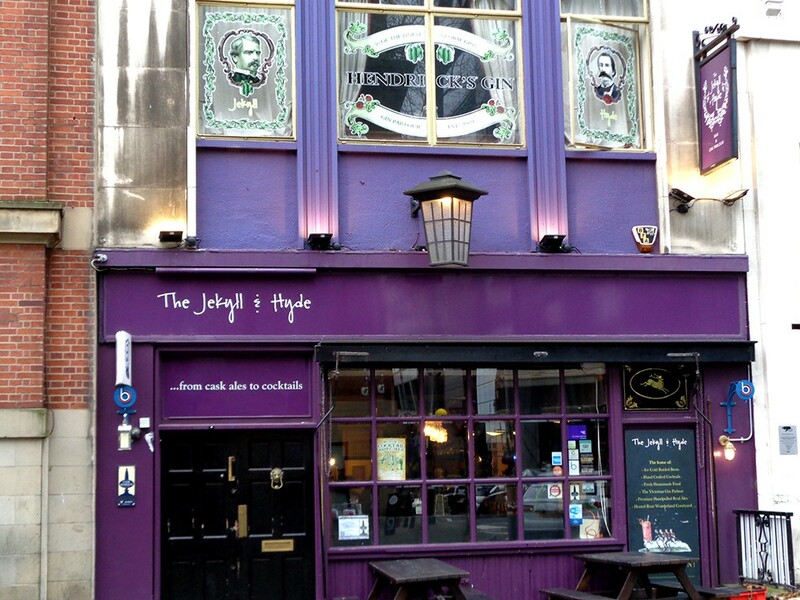 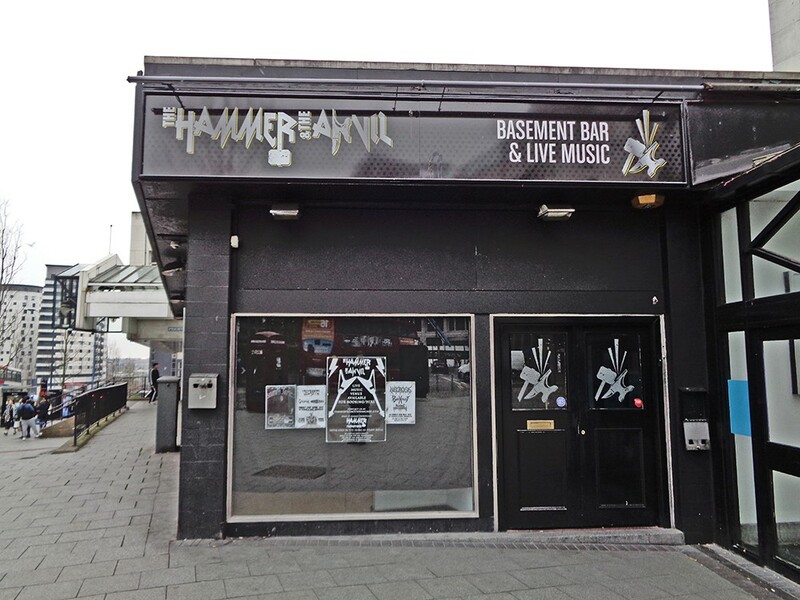 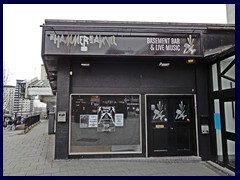 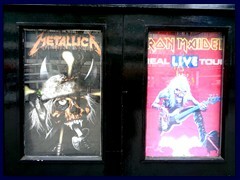 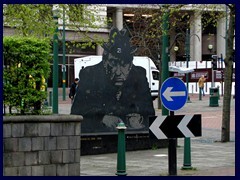 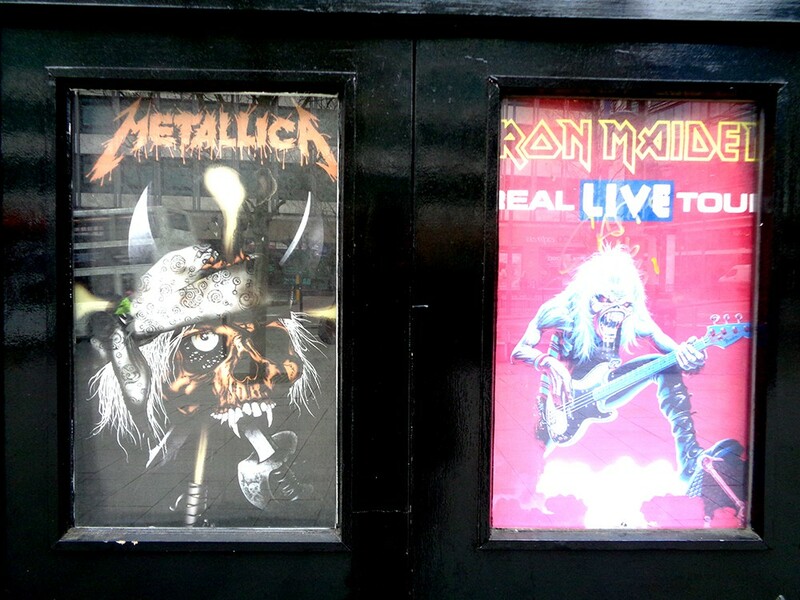 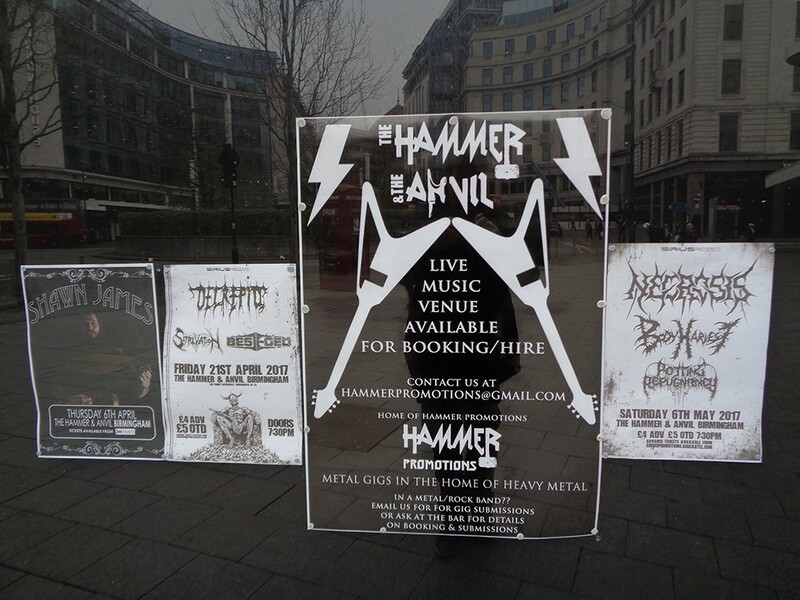 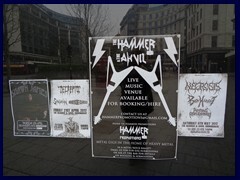 At Old Square, that Corporation St passes, you find the Tony Hancock artwork and the Hammer and Evil metal bar. 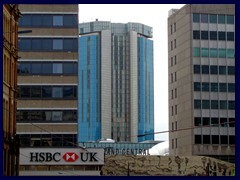 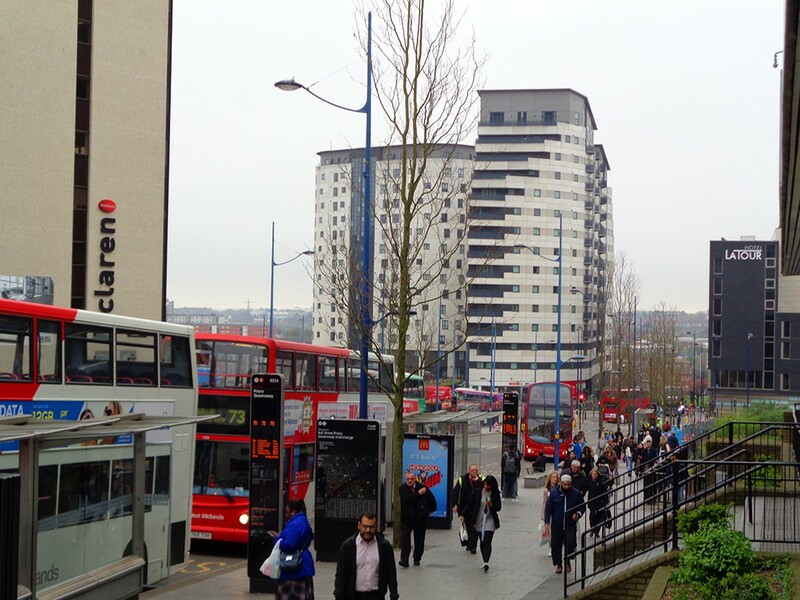 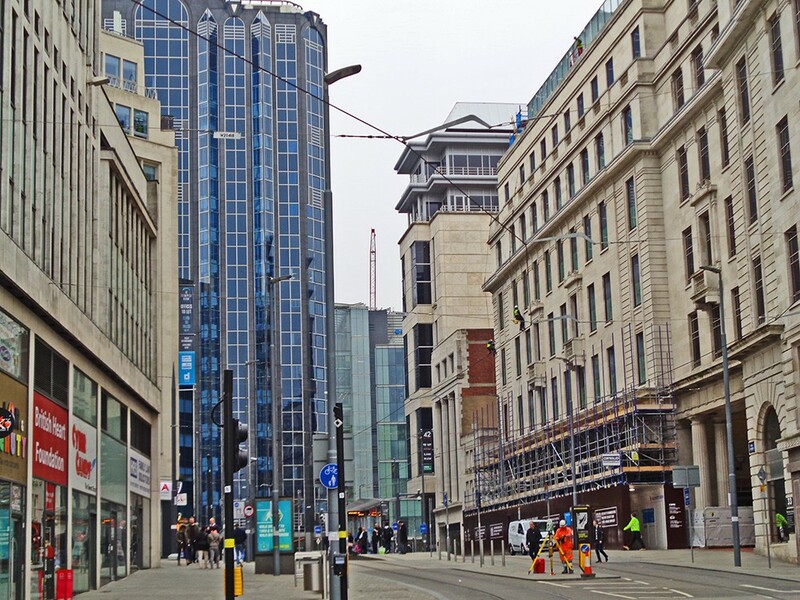 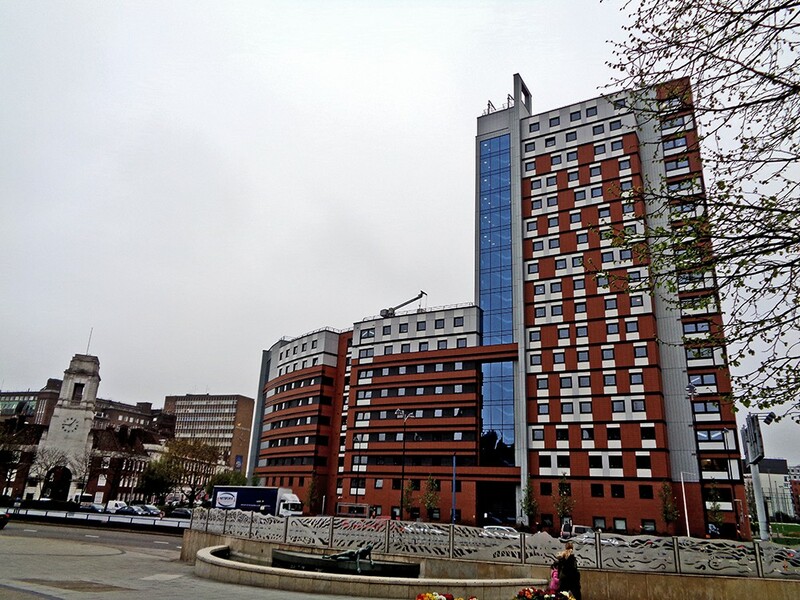 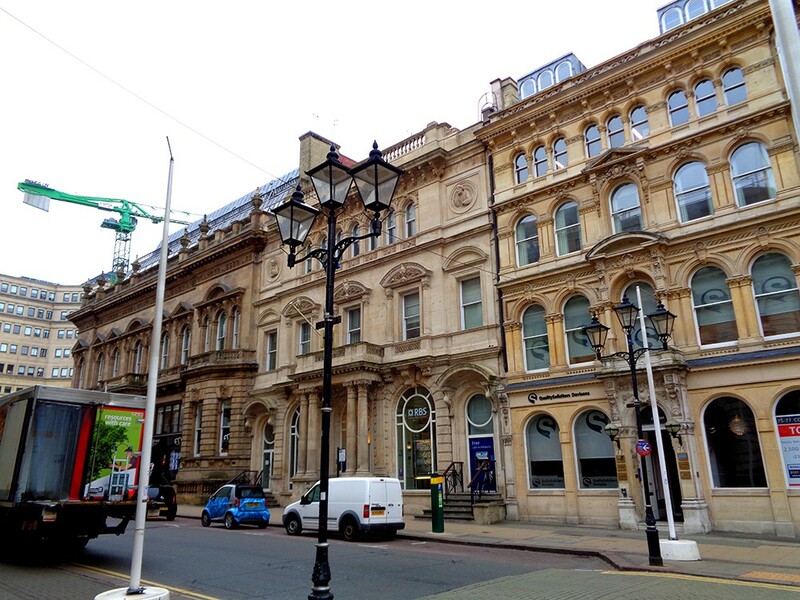 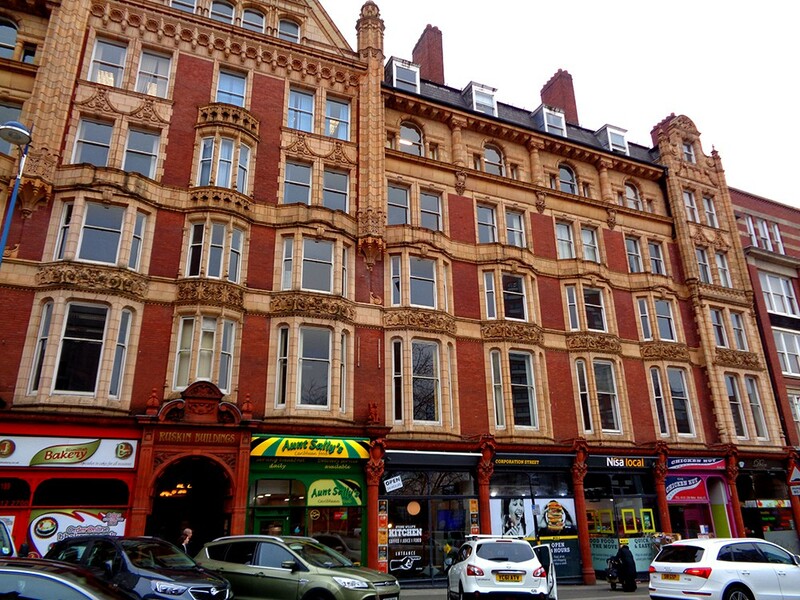 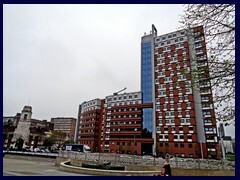 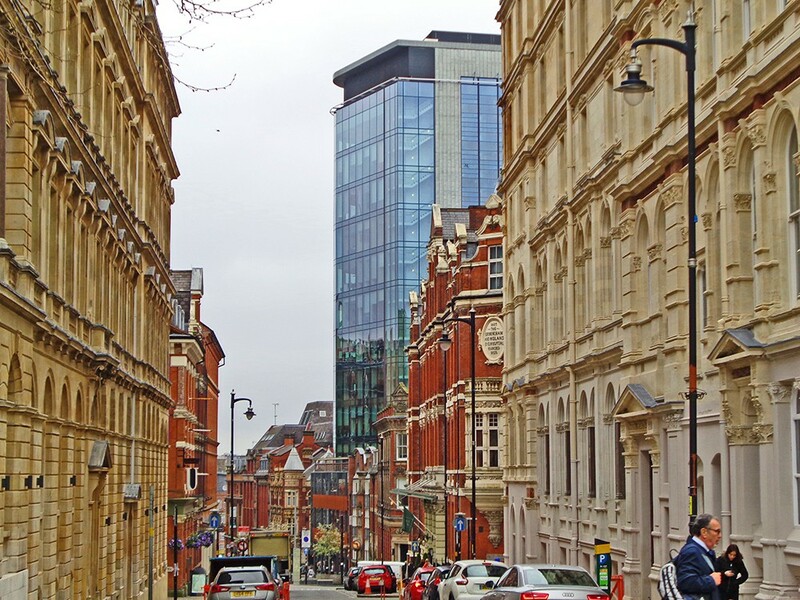 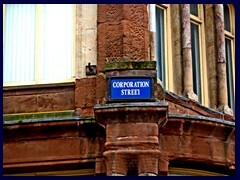 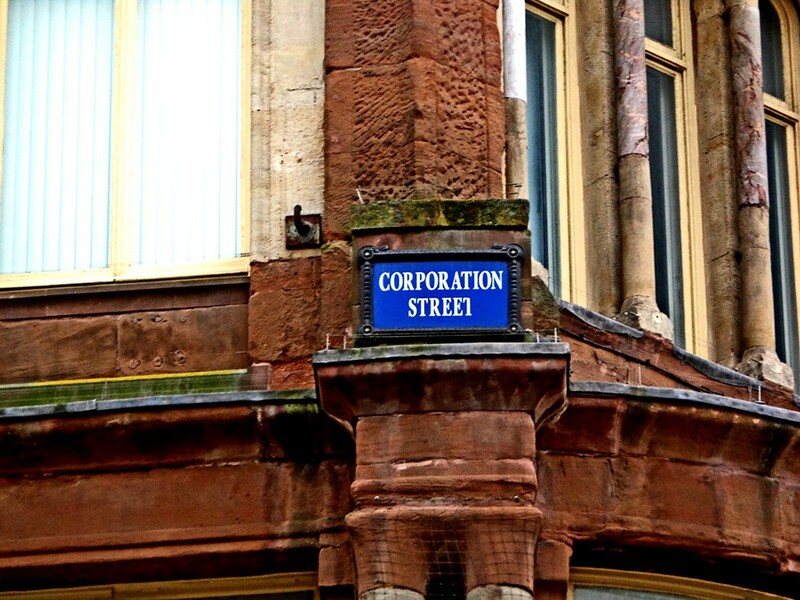 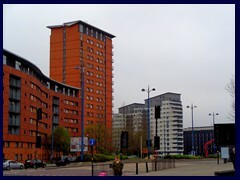 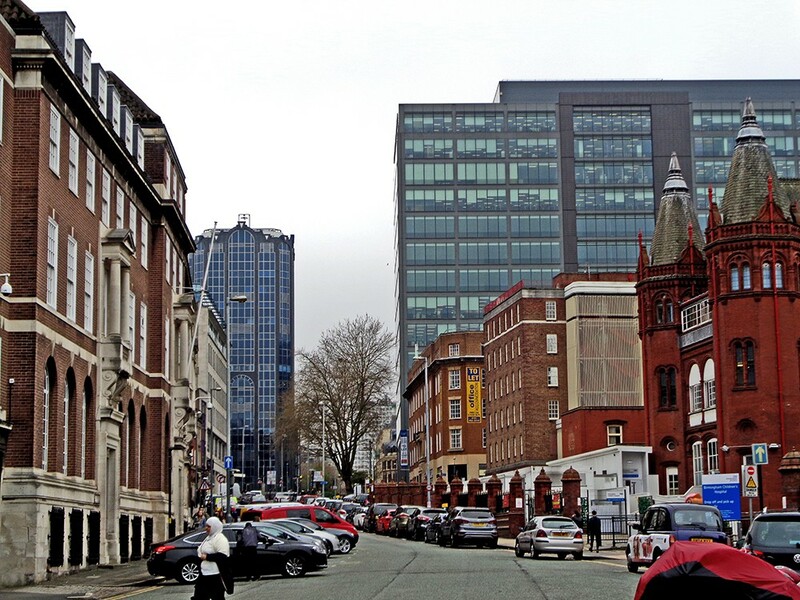 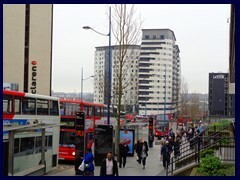 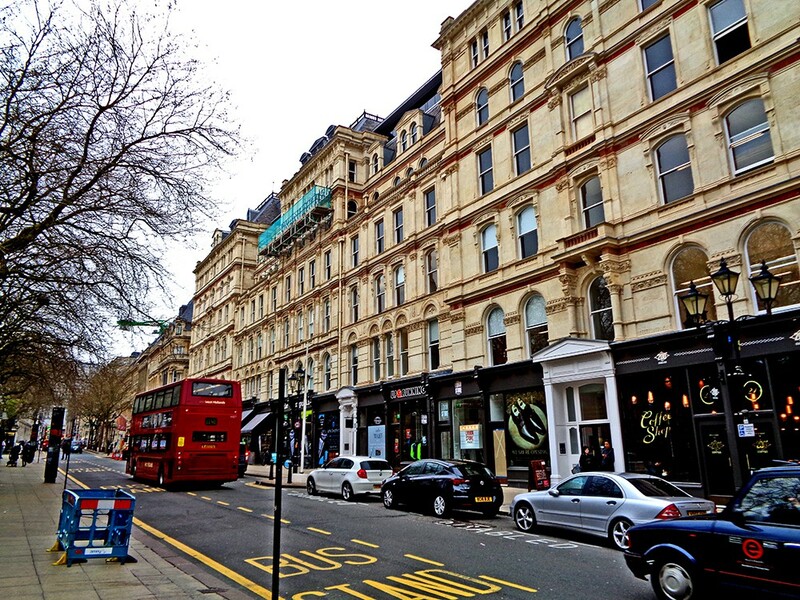 At the end of Corporation Street, you reach the Aston district, a working class area. 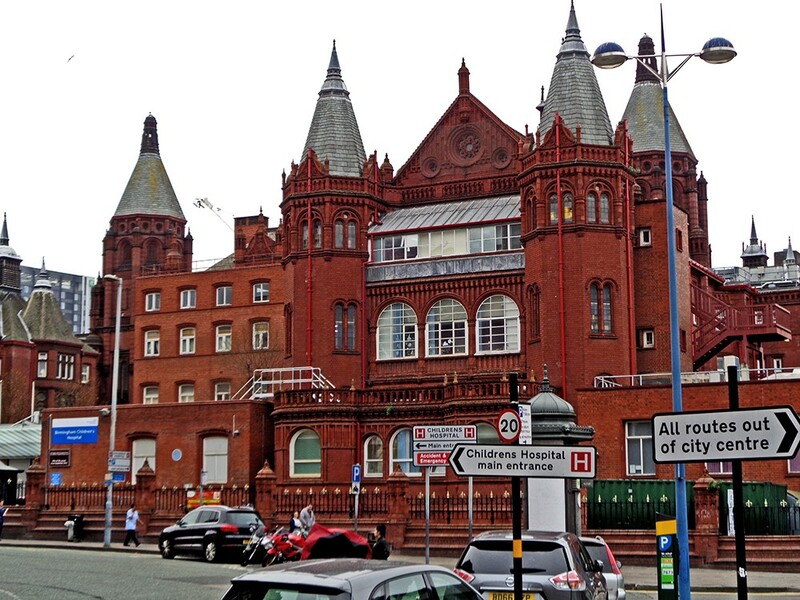 Here you find the Aston University and Ozzy Osbourne's childhood home. 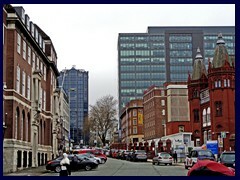 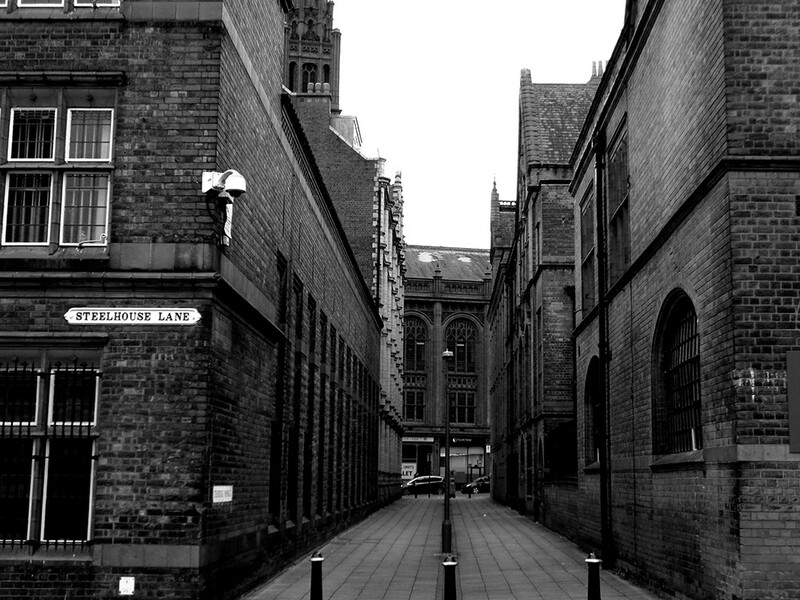 Steelhouse Lane is a lane that goes parallel to Corporation St, filled with redbrick historic buildings, like the Childrens Hospital. 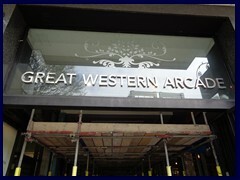 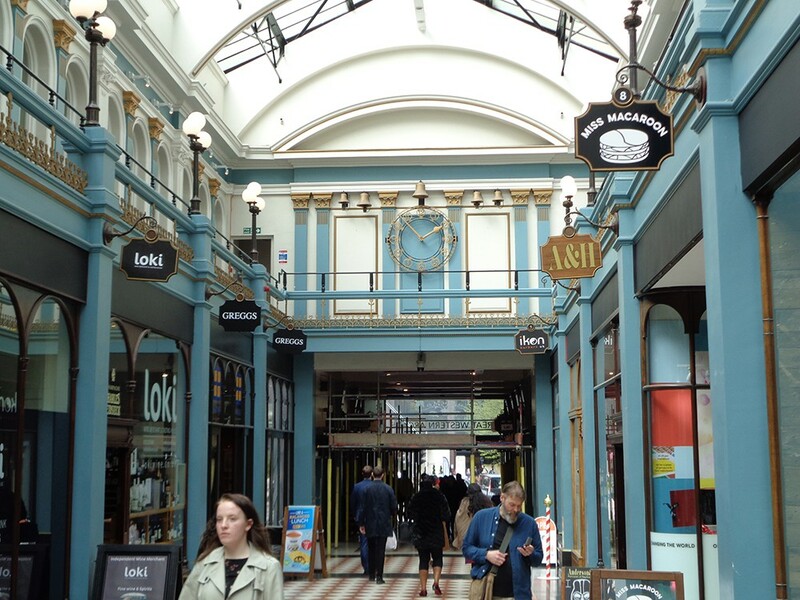 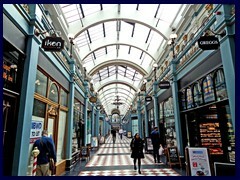 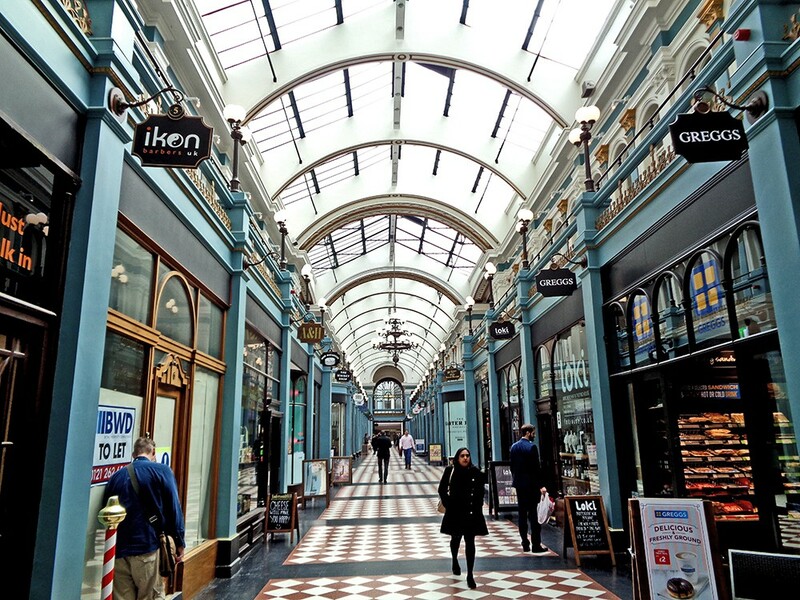 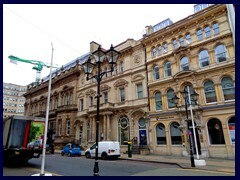 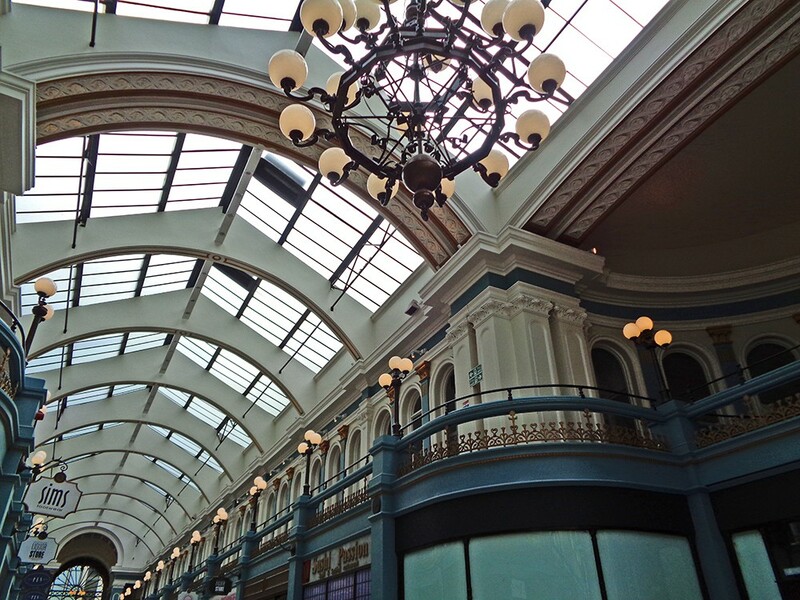 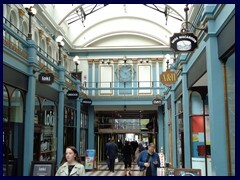 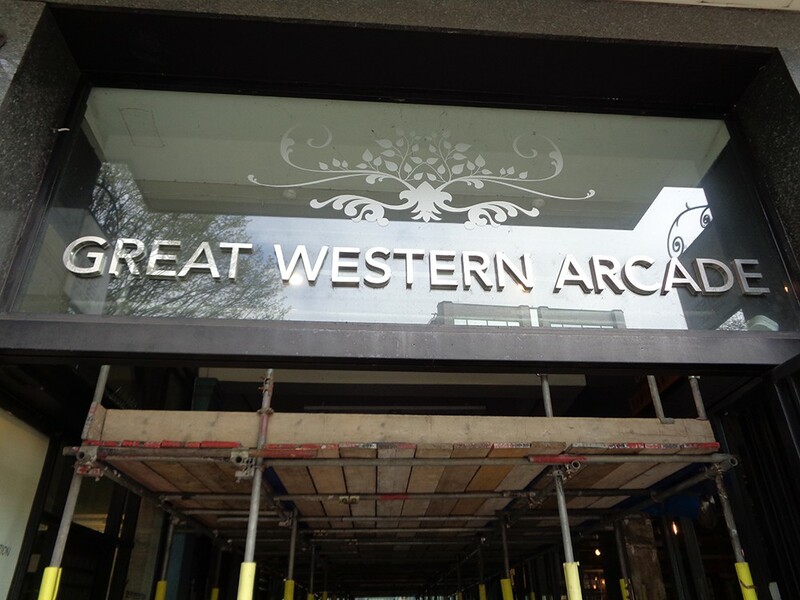 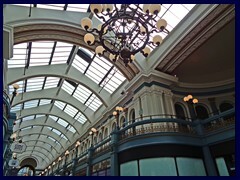 The beautiful, historic, Victorian Great Western Arcade with vintage shops, goes between Colmore Row and Temple Row.